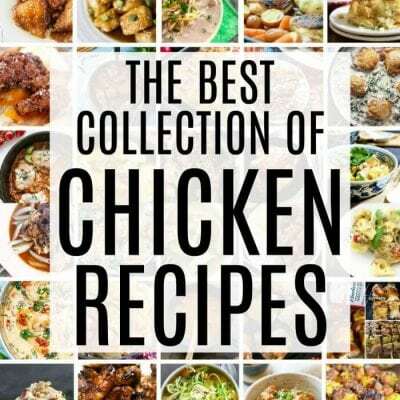 Chicken recipes are the go-to in most households and this amazing collection of chicken recipes will make sure that your dinner never gets boring! Chicken recipes are great because chicken is inexpensive, has a mild flavor, and can be prepared in so many different ways. 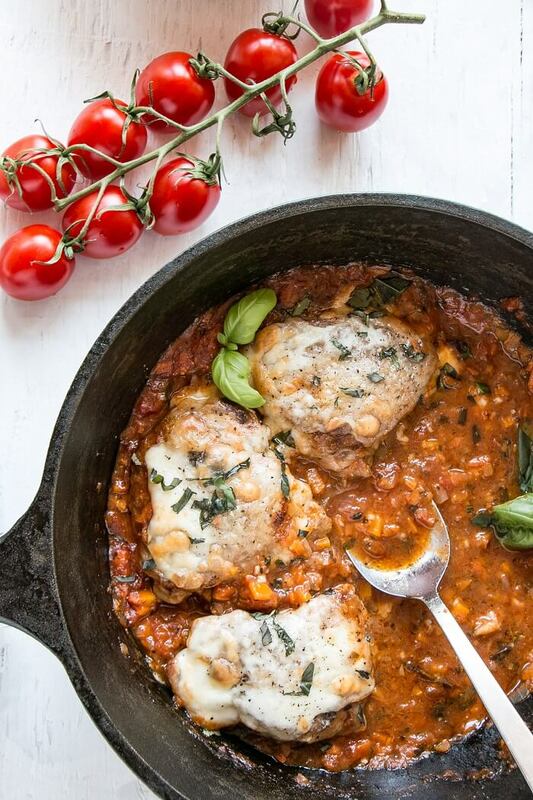 Our huge list of chicken recipes will keep you busy trying new things for weeks on end! If you love recipe collections check out our casserole recipes, instant pot recipes, bread recipes, and banana recipes too! Love these chicken recipes? Pin it for later! 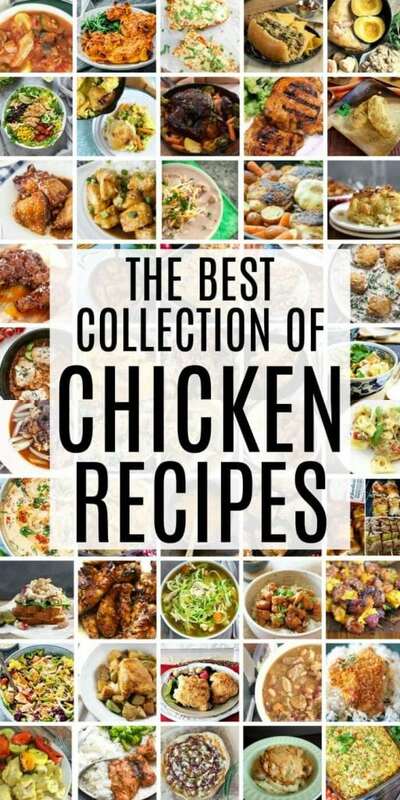 You must begin a chicken recipes collection with this one. Crispy chicken thighs, how do I love thee?? Start them on the stove top in a super hot cast iron pan and finish them off in the oven, then pair them with roast veggies and a side salad for a perfectly delicious and hearty meal! 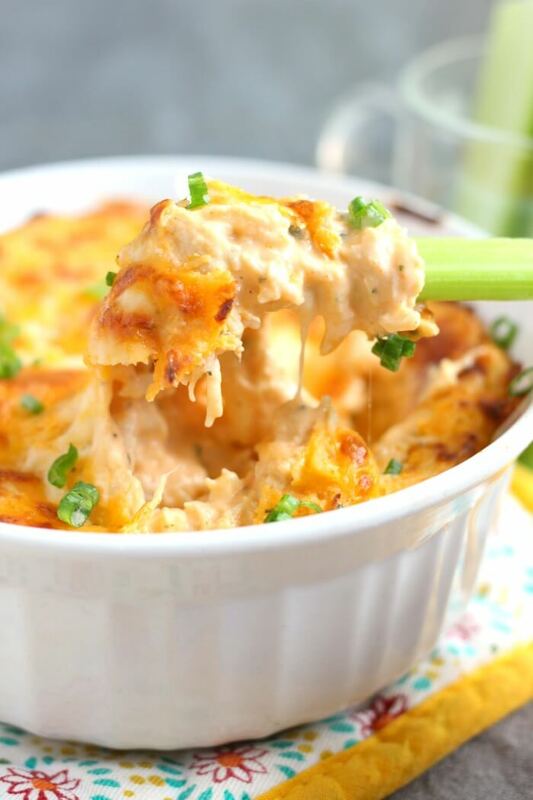 Buffalo chicken dip is one of those chicken recipes that everyone asks for the recipe. It’s so good and so easy and we definitely make it a couple times a month. Even more during football season! 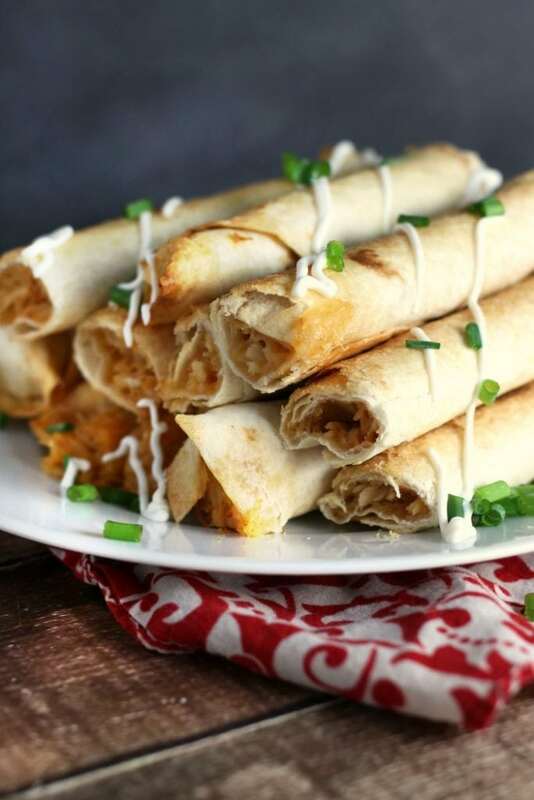 Chicken taquitos for sure top the list of my favorite chicken recipes! They’re simple to make and you can freeze them for the perfect midday (or midnight!) snack. One pot meals have to be the greatest invention since sliced bread. They save you time and energy (only one pot to clean? Score!) and are the perfect solution for busy weeknights. This particular one pot meal is made even better by the fact that it is incredibly versatile. Feel free to sub your favorite veggies! Possibly my favorite ever of the chicken recipes – but for sure my favorite of the pizza recipes. 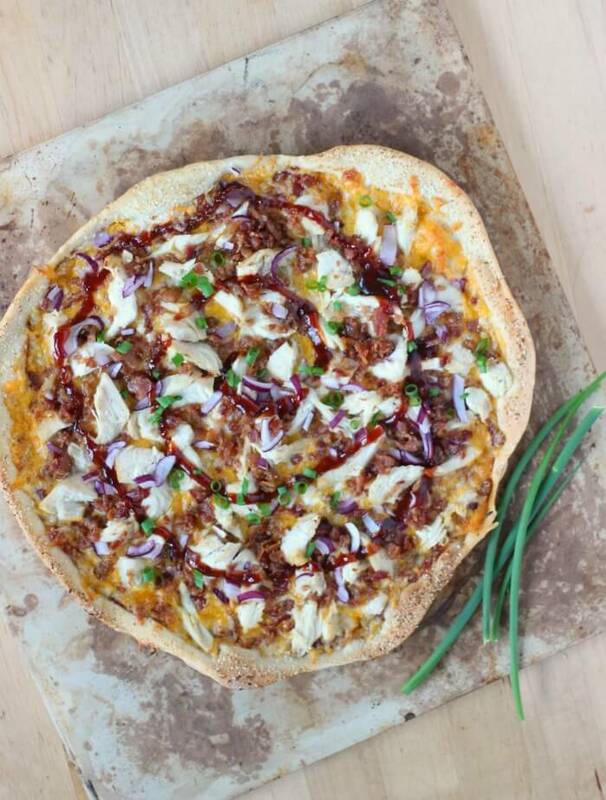 This BBQ Chicken Pizza is my amazingly delicious and I try to make it whenever I can. 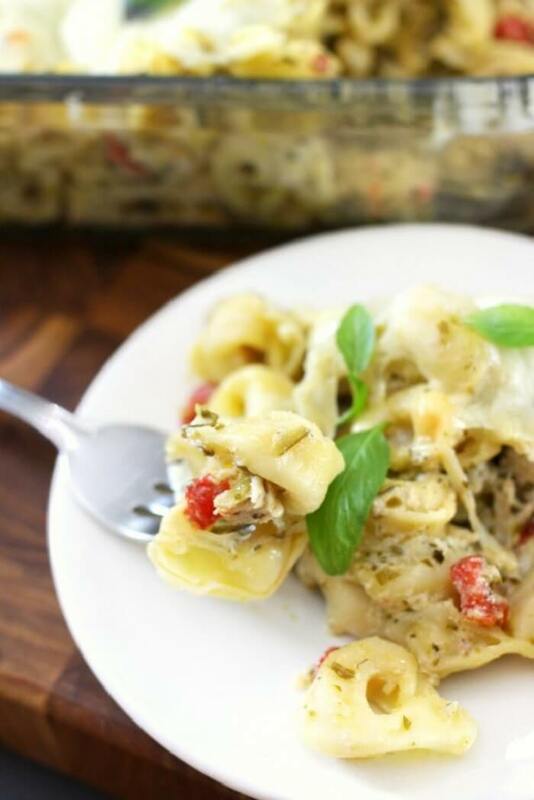 Have you ever made a pasta casserole with tortellini? Oh. Em. Gee. Talk about life changing. It just totally adds a whole new dimension to the dish. 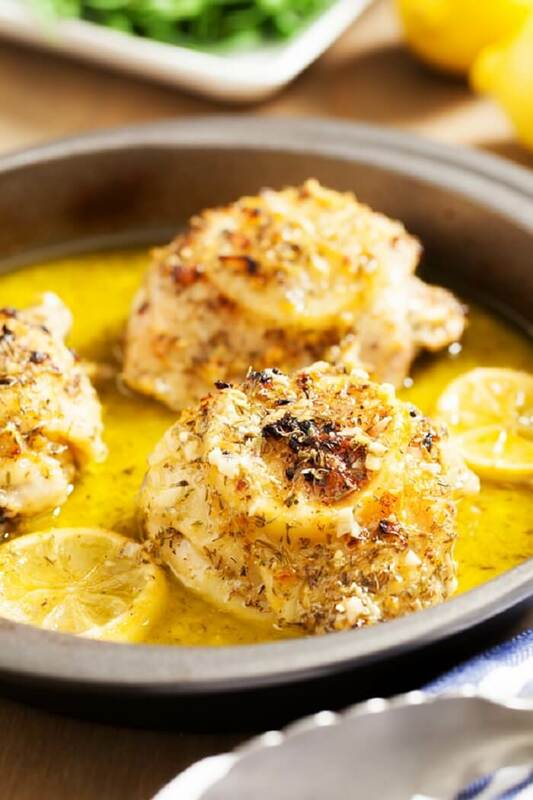 This is one of those chicken recipes that will definitely end up on your monthly rotation! 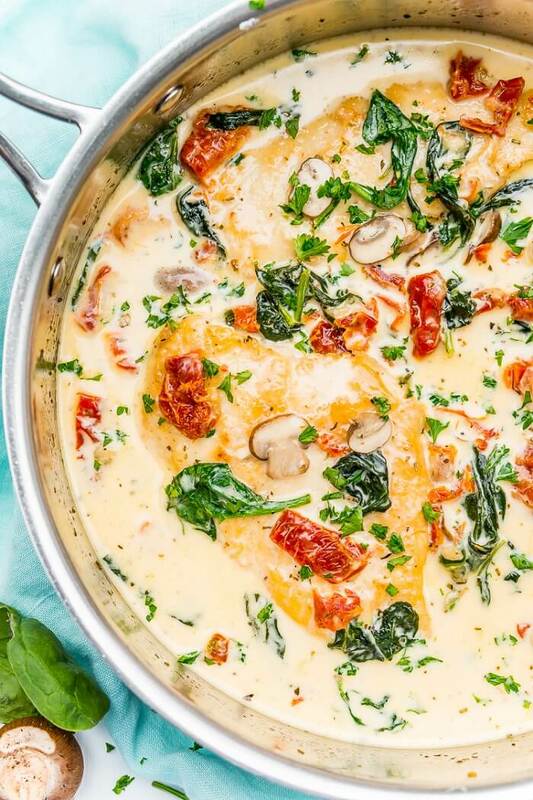 Paired with chicken, pesto, and lots of cheese, I guarantee this casserole will become a family favorite in no time. 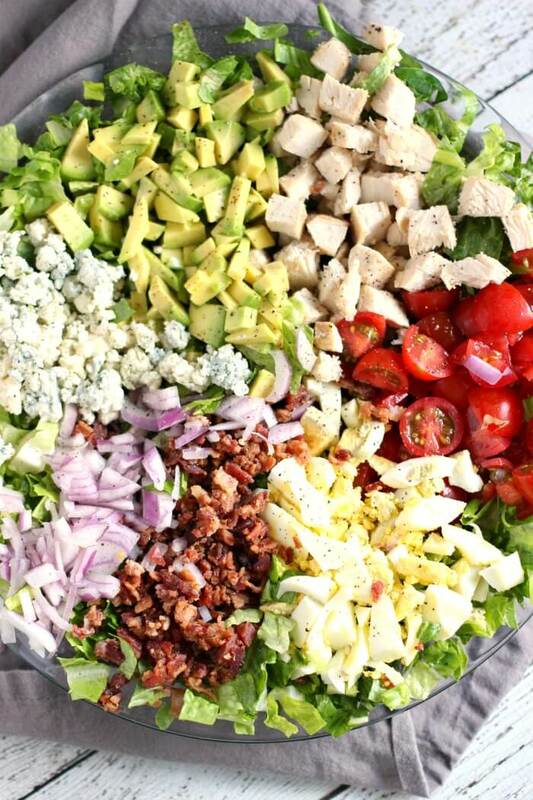 I don’t know about you, but I could eat a cobb salad almost every day and not get tired of it. Full of delicious filling veggies and meats (including chicken! ), it hits the spot every time. 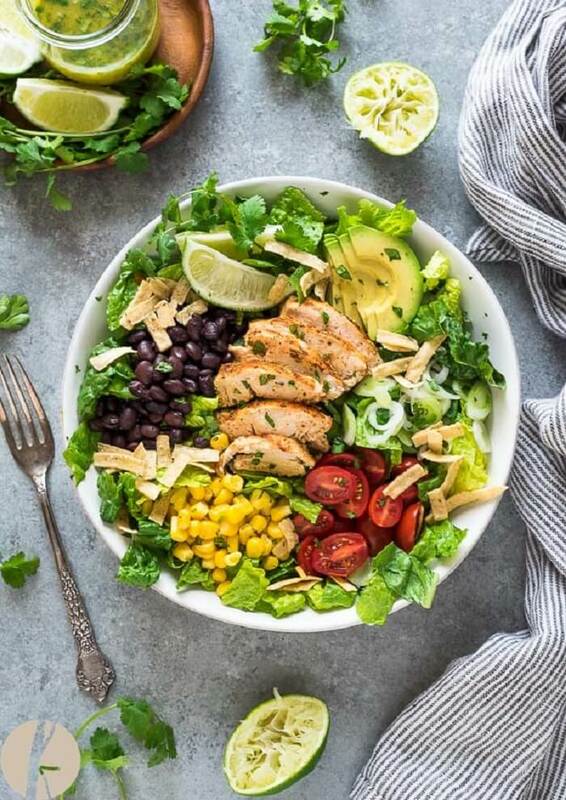 Chicken recipes should always include a good salad! 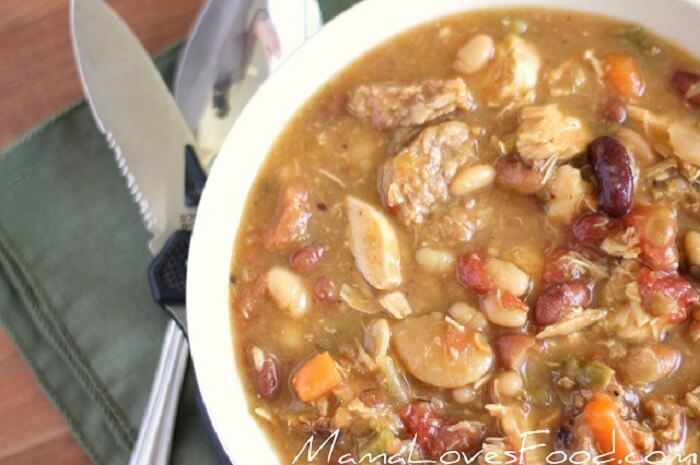 This chicken & sausage stew was inspired by The Hunger Games series. One of the characters makes a hob knob stew using whatever bits & pieces people manage to bring her. Which is basically the essence of a good stew anyway, right? This one is no different – it’s full of delicious vegetables and meats and if paired with a good crusty loaf of bread it will fill you up and make you comfortable. This kabob recipe is a favorite in my house. 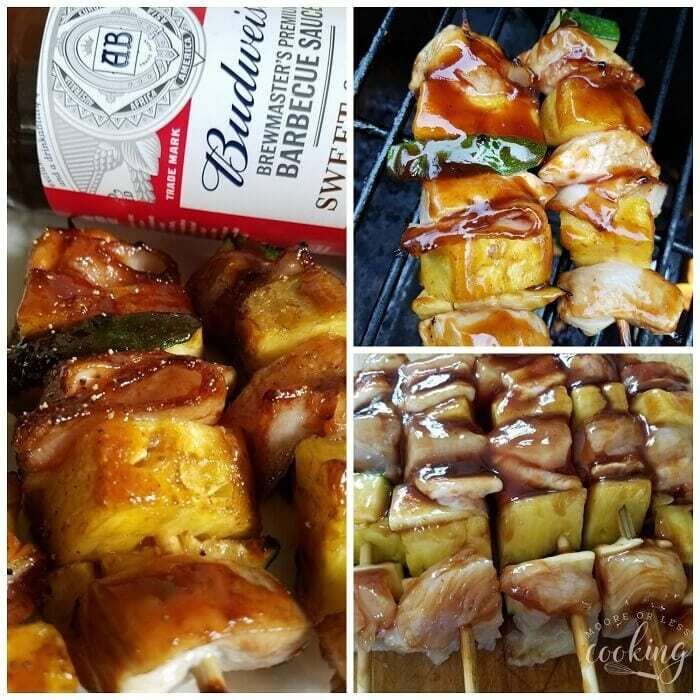 I almost can’t pull them off the grill fast enough for everybody! 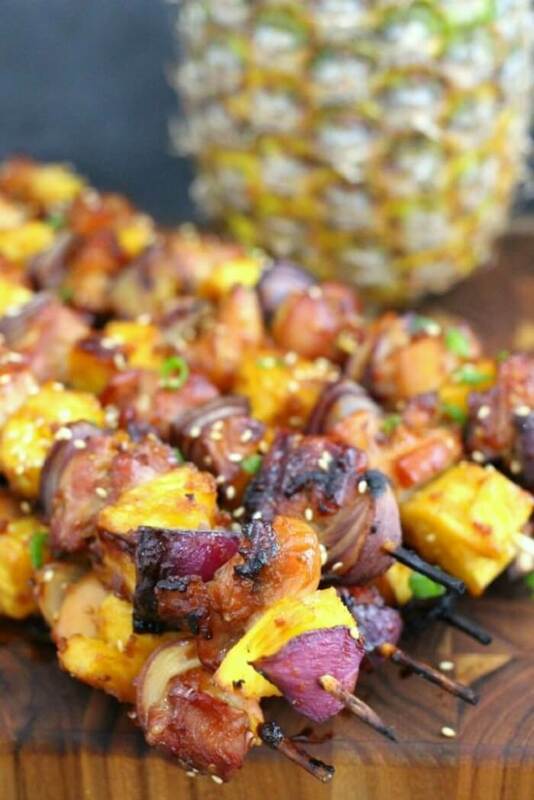 The sweetness of the pineapple and the teriyaki sauce mixed with the savory chicken and onion pieces make it a total win! 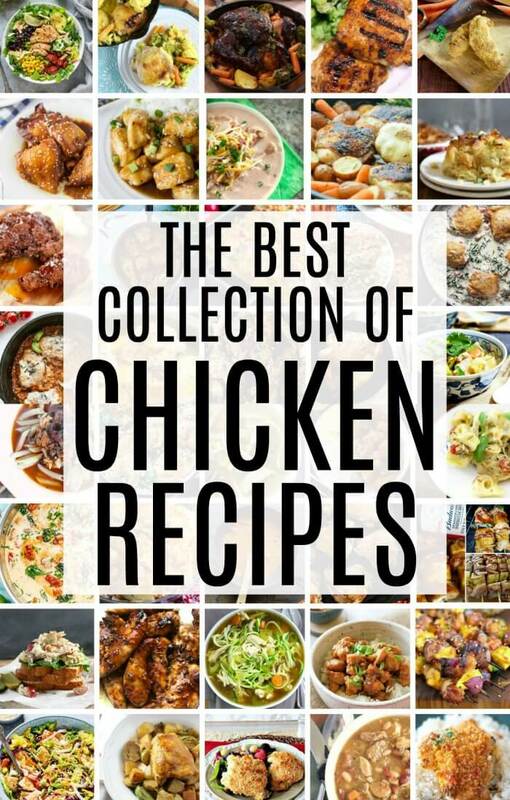 For sure it belongs with our favorite chicken recipes. 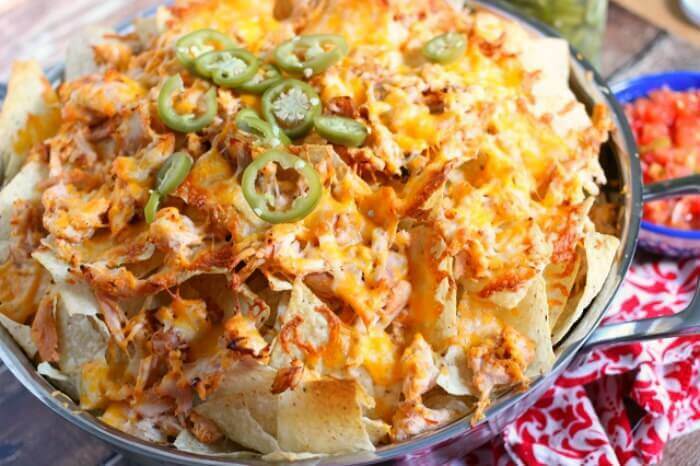 Chicken nachos are the ultimate party food. They’re perfect for game night, movie night, football games, or any day that ends in “y”. They’re also perfect for those days when you just don’t feel like spending a lot of time in the kitchen. 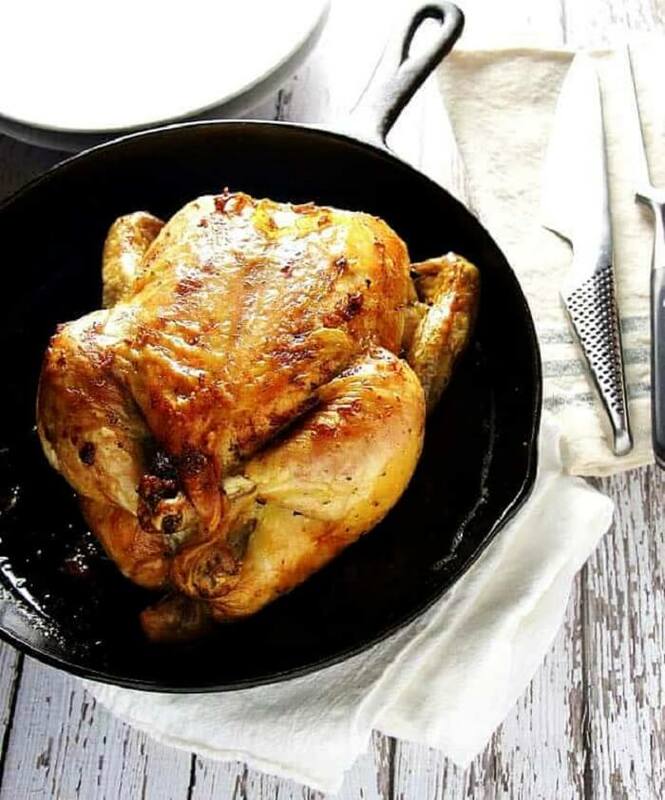 Another can’t miss on the list of fantastic chicken recipes! 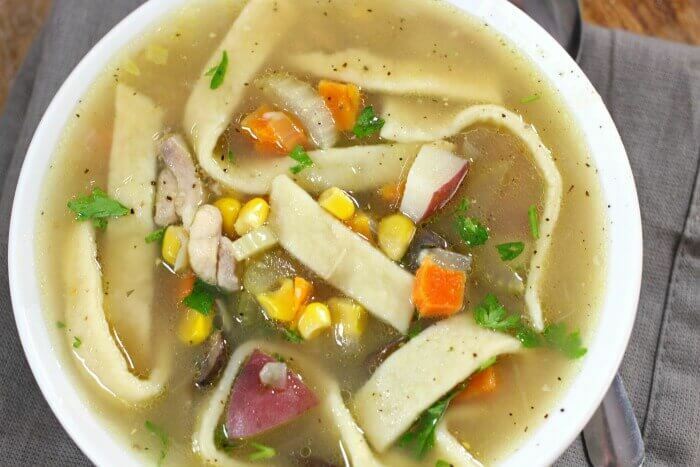 There’s a reason why chicken noodle soup is everybody’s go to when they’re feeling under the weather – it’s delicious AND healthy! Full of vegetables, proteins, vitamins and immune boosting properties, it will have you feeling better in no time. This recipe uses homemade egg noodles which totally takes it over the top! 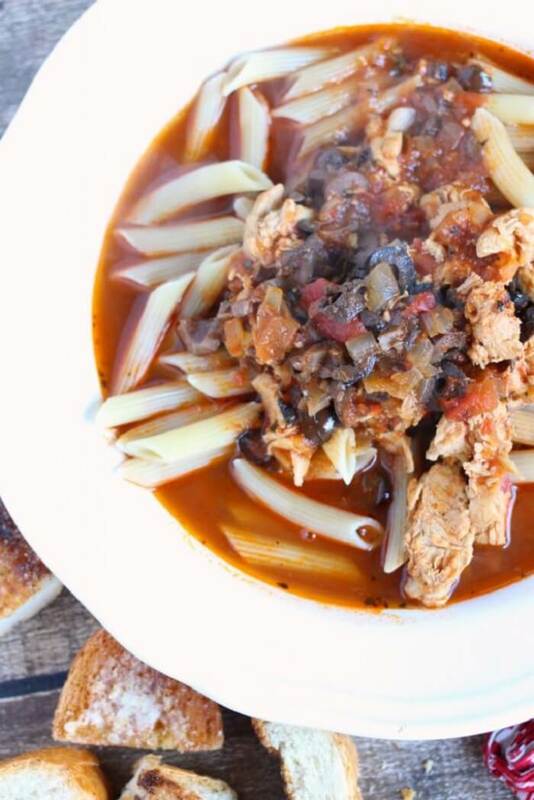 If you like chicken puttanesca, and you like soup, then I think you will LOVE this chicken puttanesca soup recipe. It’s super easy to make, and totally delicious. This is the BEST chicken salad recipe EVER. Who would have thought that adding fruit to chicken salad would be SO GOOD?? But it is. Oh, it isssssss. Are you going to make one of these chicken recipes? Which one?! 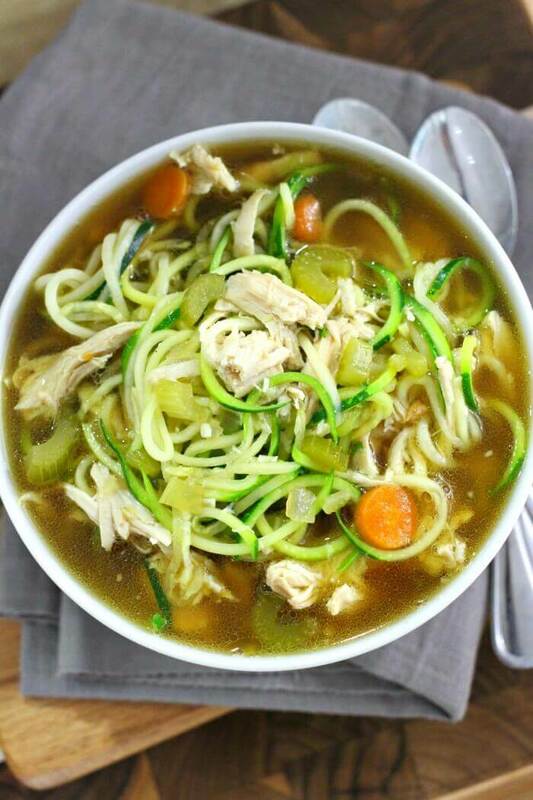 This chicken zoodle soup is a healthier version of the classic chicken noodle soup. Using zucchini noodles (I love calling them zoodles, by the way – it’s such a fun word, haha!) instead of egg noodles makes it the perfect recipe for people trying to watch their carb intake. 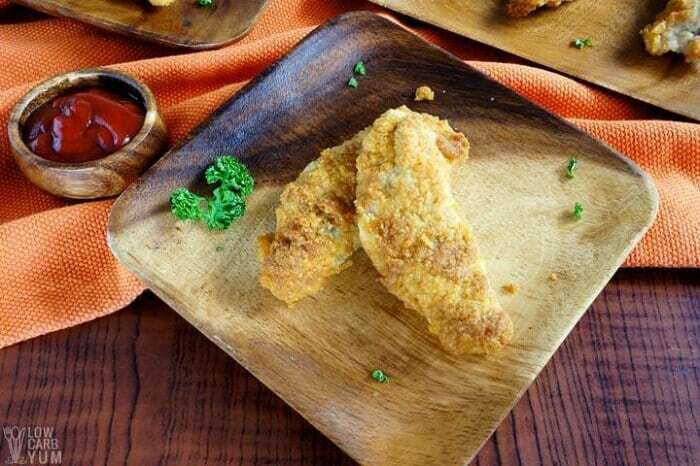 There’s no way a list of the best chicken recipes would be complete without chicken fingers! 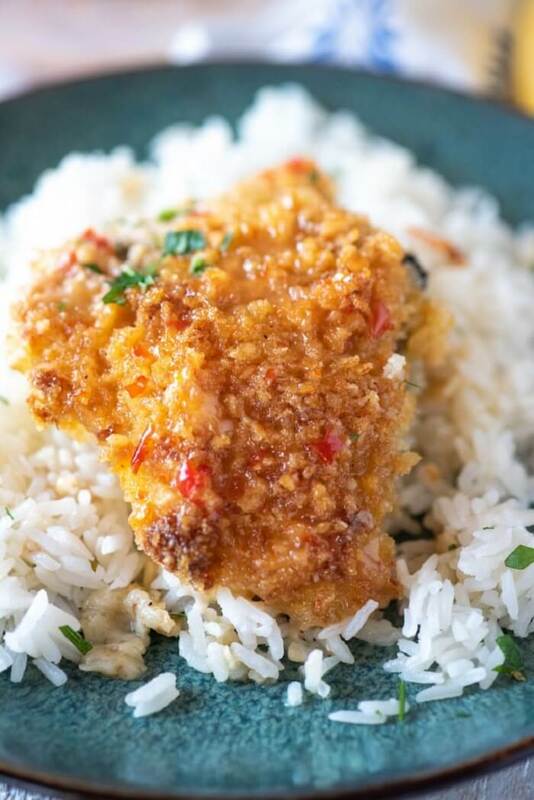 If you feel like you need to hit the road and seek out a tropical destination (we all have that feeling from time to time), then this coconut chicken recipe is for you. 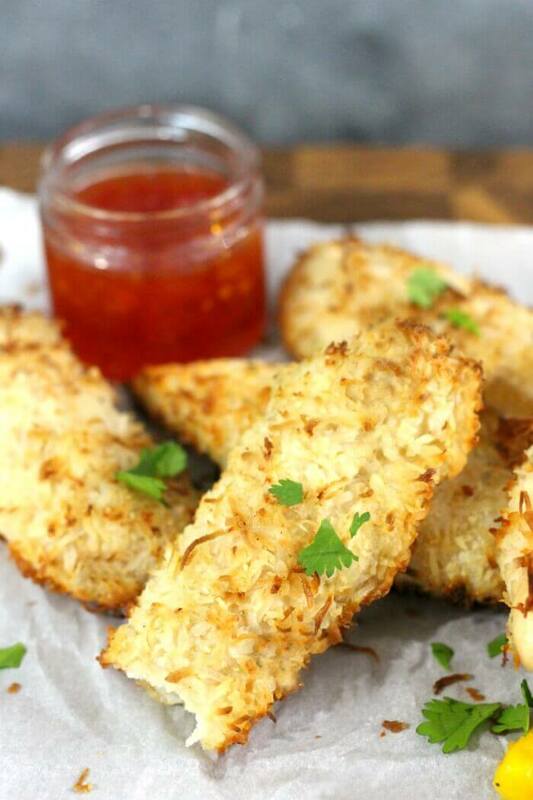 You can make it baked OR fried, whichever you like better (I like baked because it’s a little healthier) and it tastes great paired with a tropical fruity salsa or a spicy sweet chili sauce. It will make you feel like you’re sitting by the beach on a tropical island, for sure. 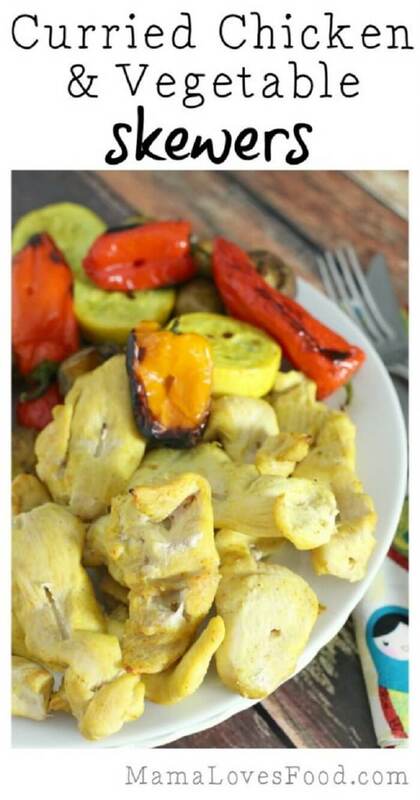 I love all things curry and these chicken & vegetable skewers are no exception. Make them in the oven like I did, or throw them on the grill! No skewers? No problem! 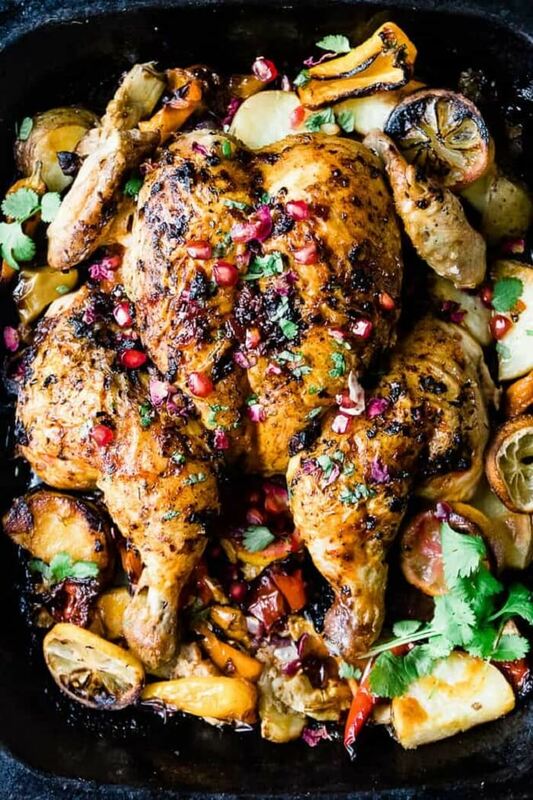 Just toss it all together on a roasting pan and ouila! You’ve got a delicious flavorful meal for the whole family in no time at all. I can’t say enough good things about this chicken taco casserole. It is a HUGE hit in my house…the kids gobble it up like they’re never going to eat again and we NEVER have leftovers. Sometimes I like to use Doritos instead of plain corn chips and let me tell you…it’s worth it. 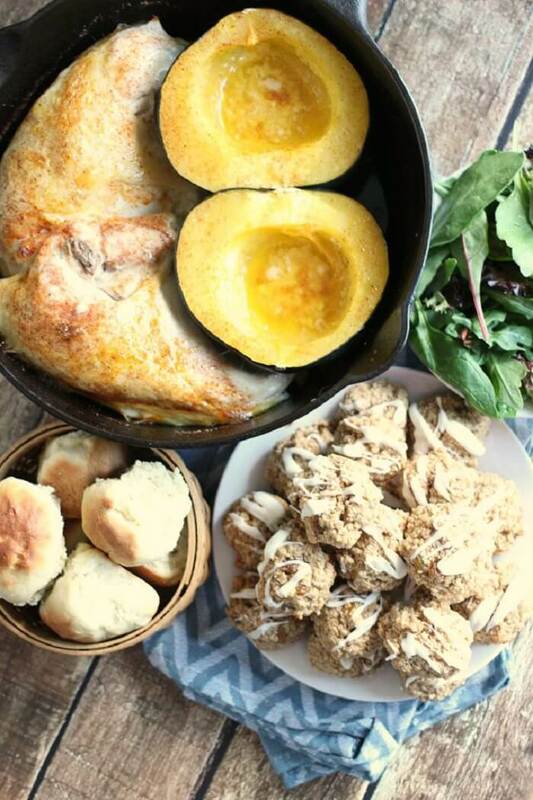 You will definitely want to add this chicken recipe to your regular meal rotation! This dish serves a crowd! It’s the perfection solution for entertaining. If you want to make it for a smaller group of people, just make it in two pans instead of one and freeze the second! Don’t worry….this honey sriracha chicken isn’t as spicy as it sounds. It’s slightly sweet with buttery notes and SOOOOO super flavorful. Ten to one it’ll be gobbled up almost as fast as you can make it. 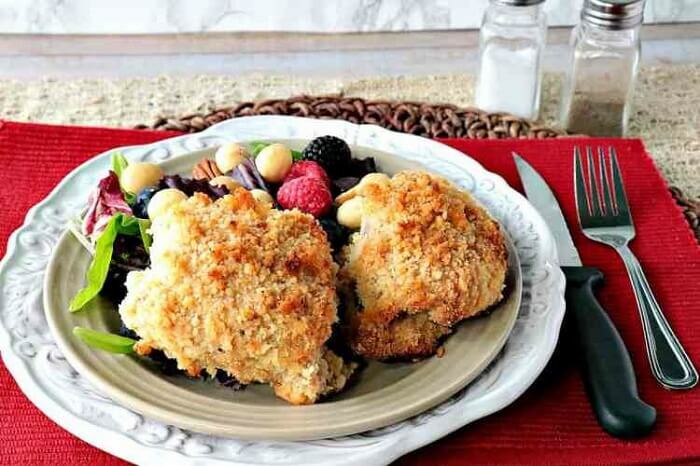 This is one of my mom’s chicken recipes! 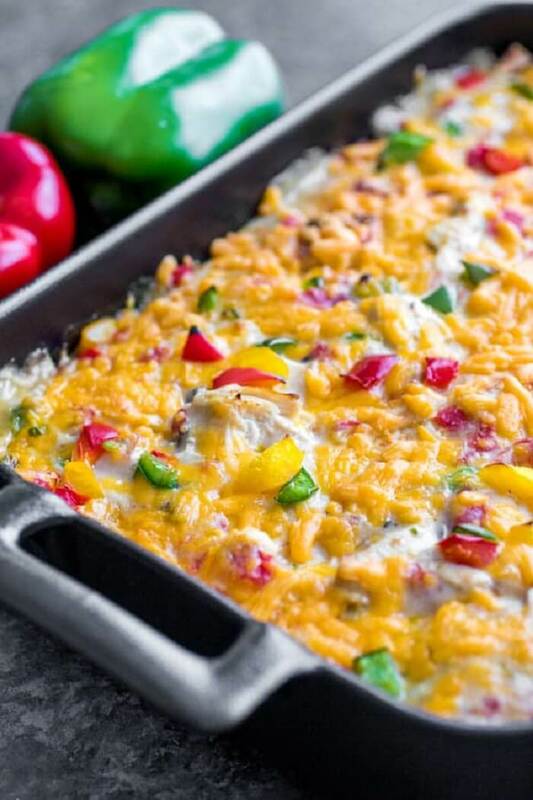 This chicken & rice casserole is a throwback to the 80’s when casseroles ruled the kitchen. Anything that takes me back to my childhood has to be considered the ultimate comfort food. 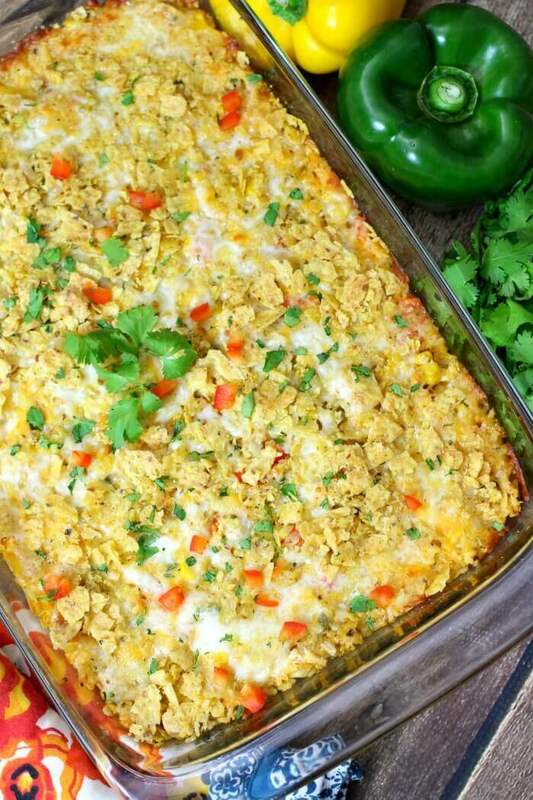 This casserole is great for meal prepping, too! It’s easy to double or triple the recipe and throw the extras in the freezer for those nights when preparing a meal is just too much to handle. M’mm…..curry. Curry AND a one pot meal? Even better! It’s a full meal in and of itself, but you could also round it out a little with some rice or zoodles. 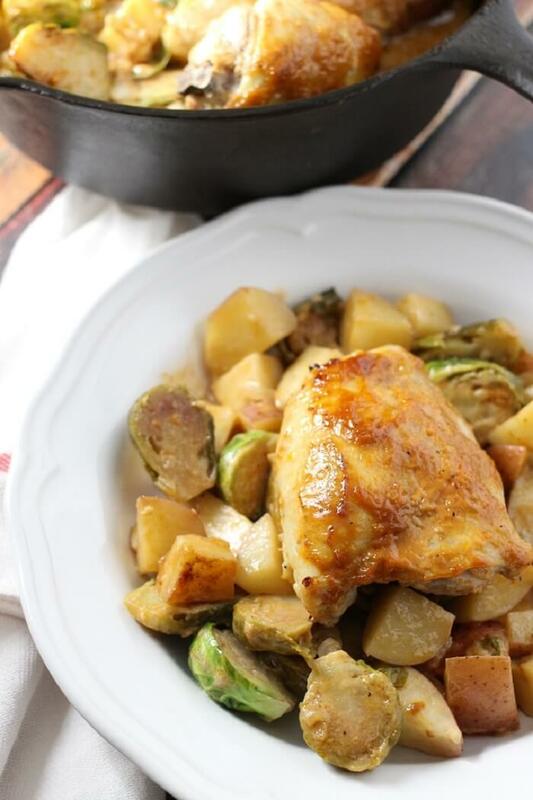 You’re going to love this one pot dinner! One pot meals are great to bring to neighbors, friends or relatives who might need a little helping hand. 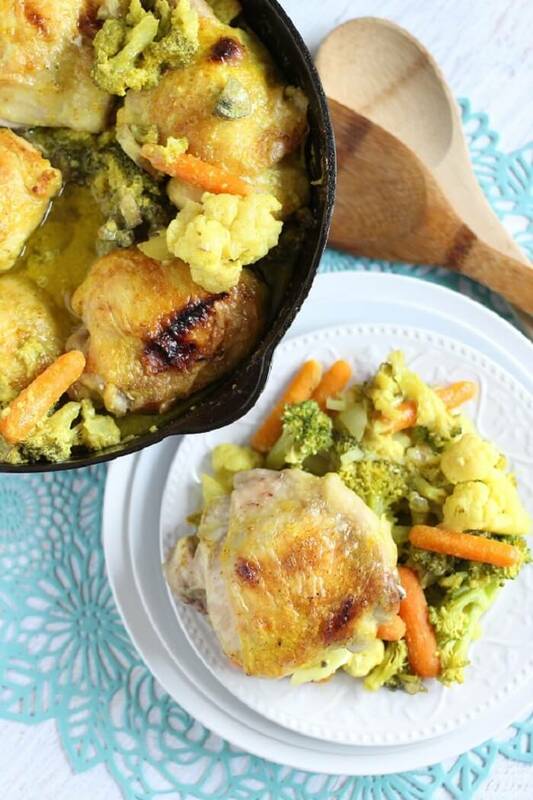 This one pot meal would be a great gift to give to someone in need! Add some biscuits for the side and cookies for dessert and be sure to bring it in a disposable roasting tray, and your friends won’t have to lift a single finger (except to maybe stick it in the oven when they’re ready to eat). These sandwiches are quick and easy and full of yummy flavors! They’re the perfect solution to a busy weekday or even as a late night snack. I love chicken recipes that are easy to prepare. 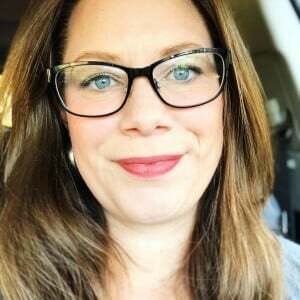 You know those days….you’re busy, you work all day, kids have soccer practice in the afternoon, then you have to run errands and just WHEN are you going to have time to fix a meal for everybody? This simple soup is the solution. Throw everything in the slow cooker in the morning, and by the time you get home it’s ready to eat. It’s also a great alternative to Taco Tuesday (because admit it….as much as we all love tacos, sometimes you just want something different). Don’t waste your hard earned money on Chinese take out. 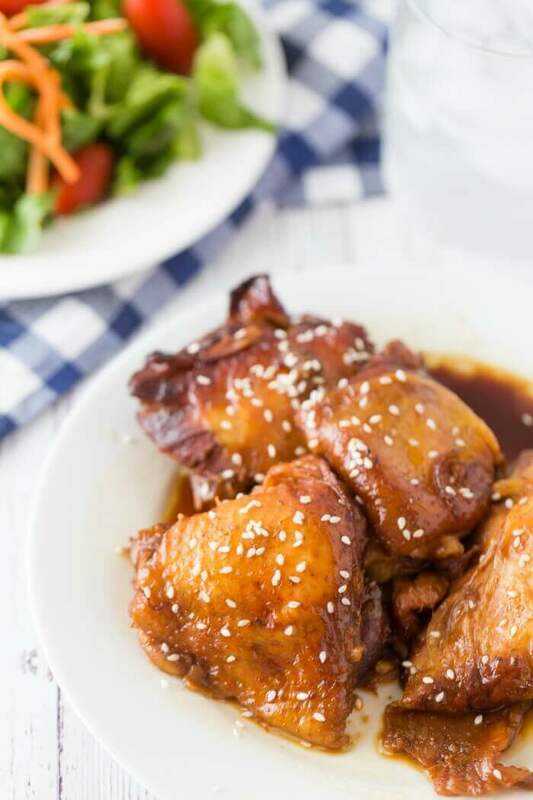 Make this slow cooker honey garlic chicken instead! It’s sweet, it’s savory, it’s everything you love about your favorite take out dish, but sooooooo much better. This simple Italian stew recipe is wonderful because not only is it easy to make, but it’s incredibly healthy, it’s kid-friendly (my kids love love love it! ), and you can make a huge batch and freeze it for later. If your kids aren’t super into the soups and stews thing, make a quick pot of spaghetti and pour it over top. Chicken thighs are wonderfully flavorful. The problem is, some people love the flavor but hate the bones. That’s where these boneless chicken thighs come in! 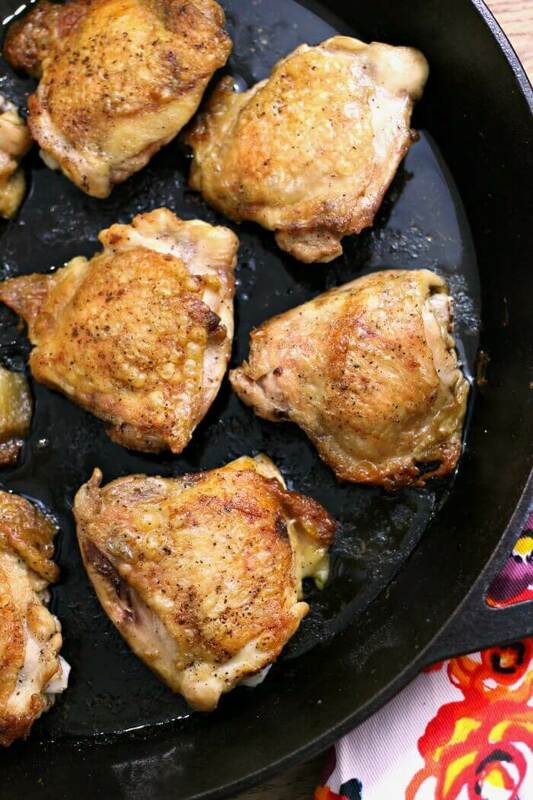 And because they’re boneless, they don’t take as long to bake, so you can have this juicy tender thighs on your dinner table in less than 30 minutes! That’s what I call a win! Do you love bang bang shrimp? Of course you do. What’s not to love? This copycat is a chicken version of that scrumptious seafood dish. And you’ll probably go nuts over it, because it’s THAT good! I have made this chicken several times and let me tell you…it’s delicious. It’s only FIVE ingredients, which makes it the perfect recipe for when you want something super flavorful but don’t want to put in a ton of work! I love to serve it with mashed potatoes and roasted veggies, but it’d also be great over rice or shredded for tacos or sandwiches. Broccoli, cheese, and chicken. That’s the stuff that dreams are made of. And you’ll be having lots of good dreams once you take a bite of this stuffed chicken. Macadamia nuts can be a little pricey. So this is a dish best kept in reserve for special occasions. That said, you definitely DO want to make it for a special occasion because it is THAT good. 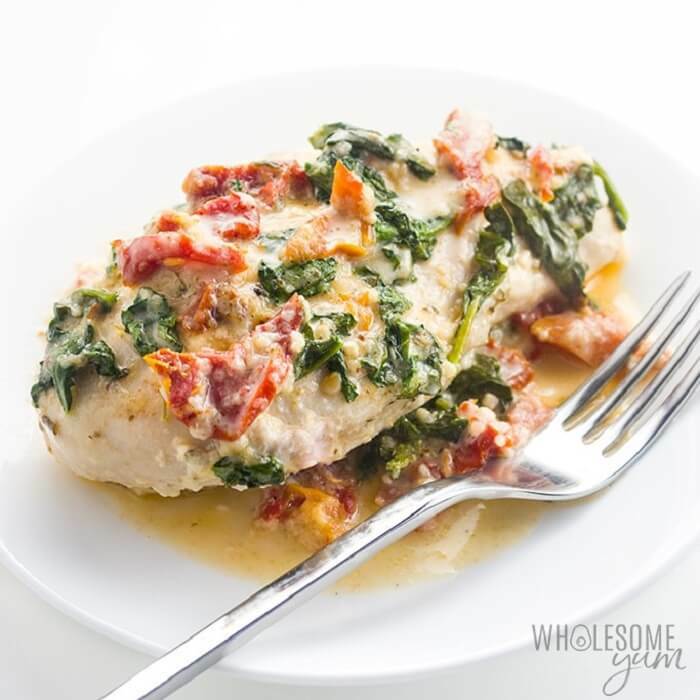 Bonus – it’s gluten free, so if you are having guests over with food sensitivities, this would be a great dish to serve them! 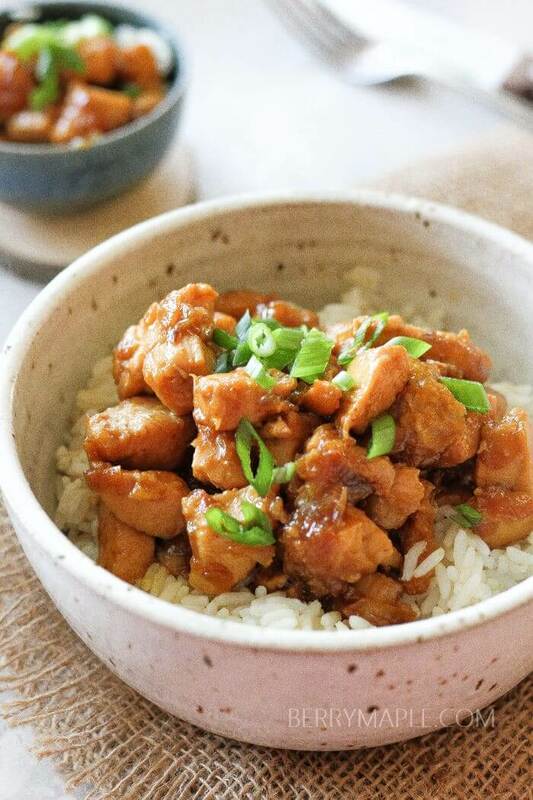 Orange chicken is delicious already, but what takes this recipe over the top is the addition of caramelized onions! M’mm…my mouth is watering already just thinking about it. 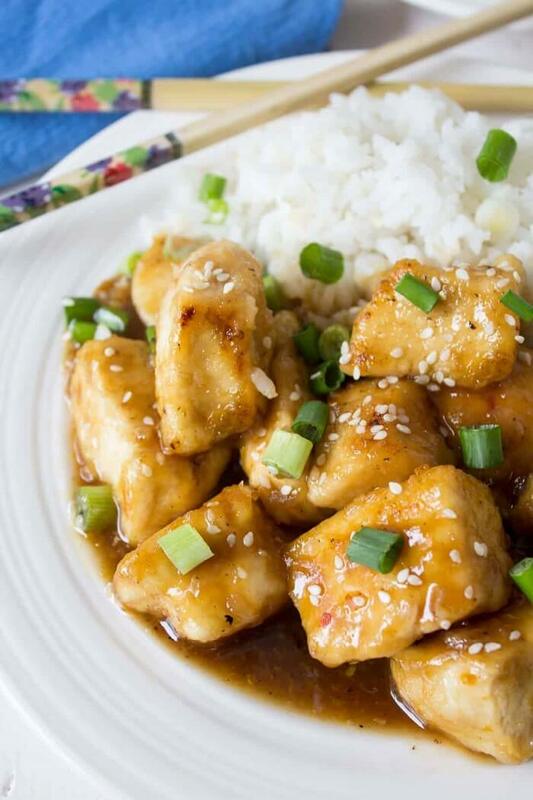 You’ll definitely want to give this orange chicken a try! 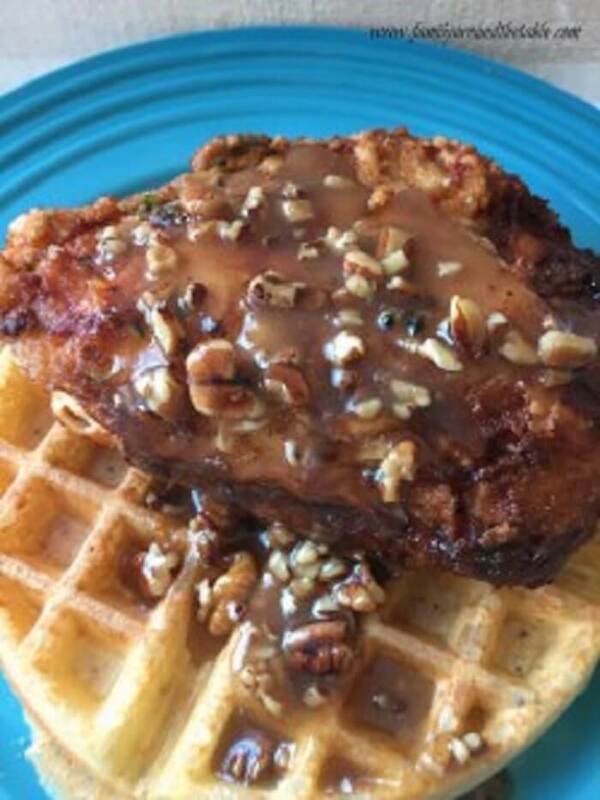 Chicken and waffles is a dish that certainly has gained popularity and come into it’s own in recent years. Is it breakfast? Is it dinner? Either way, it’s absolutely delicious. 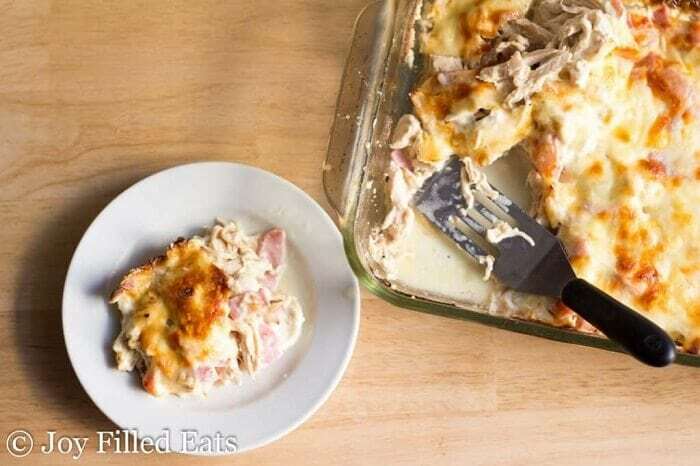 Believe me when I tell you, if you’ve never had a chicken cordon bleu casserole, then you are MISSING OUT because it is absolutely DELICIOUS! I like adding chopped fresh broccoli to mine to round it out a little and make this casserole a full meal on it’s own, but you could definitely skip that and just serve it on the side! 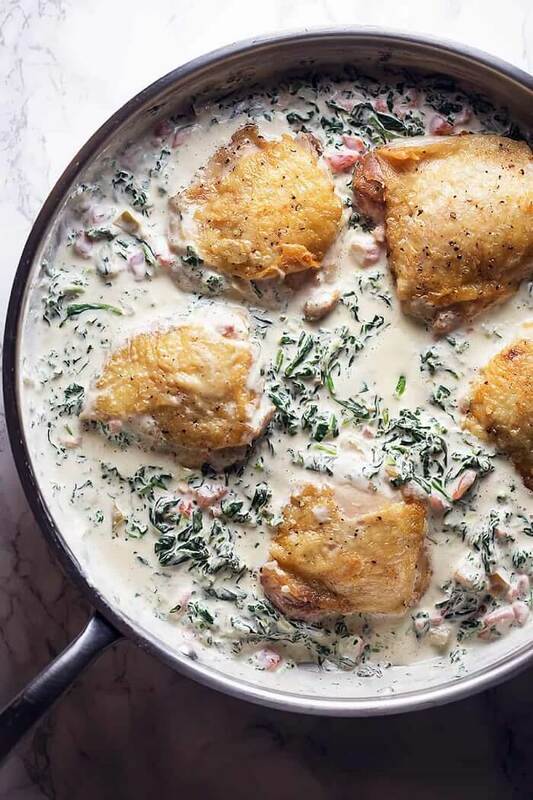 Chicken fricassee is a classic French dish that’s reminiscent of a creamy stew. It smells AND tastes amazing. While this particular recipe isn’t the usual “fix it and forget it” style we usually associate with slow cooker meals, the little bit of added prep will be well worth it when it’s filling your house with amazing smells and making your mouth water all day. Chicken Recipes – More Collections Like This! This meal is perfect for a big family. It’s inexpensive, simple to make with minimal ingredients, but nutritious and full of flavor! 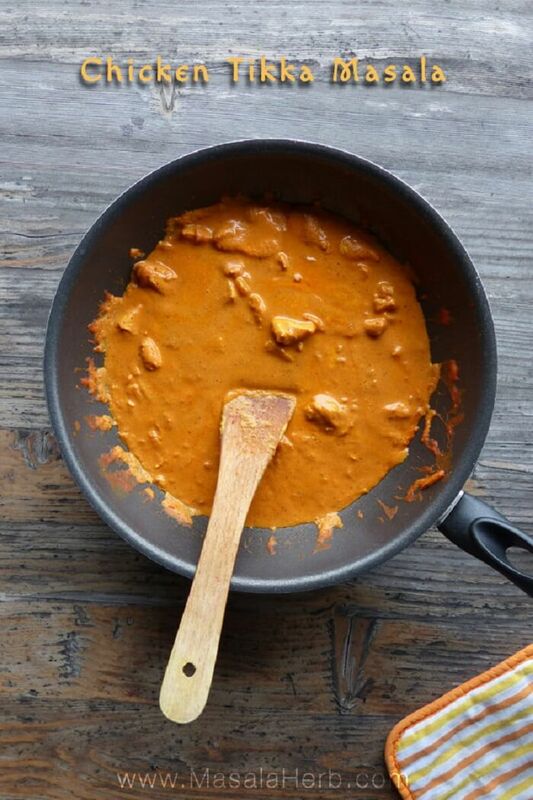 Chicken tikka masala is a creamy, flavorful, tomato based curry. It smells amazing, it tastes amazing, and even better it’s ready for the table in just about 30 minutes. 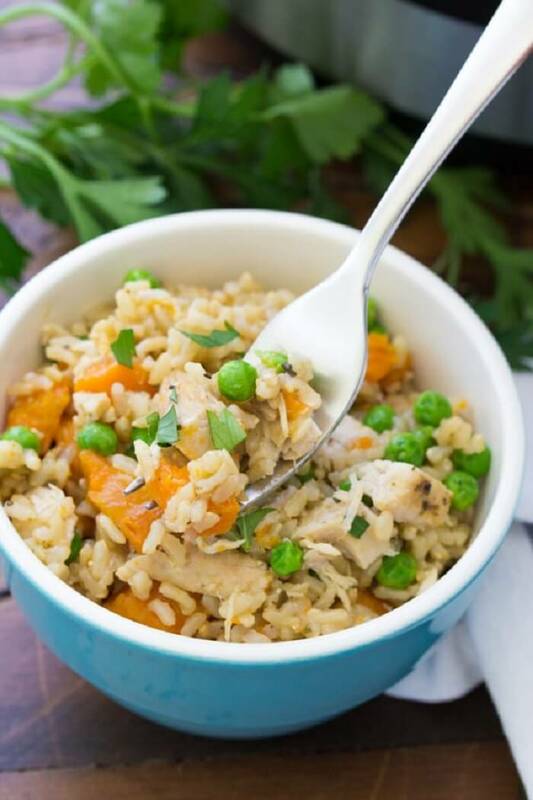 It’s great served over rice, or add in some mixed veggies for a more rounded meal! 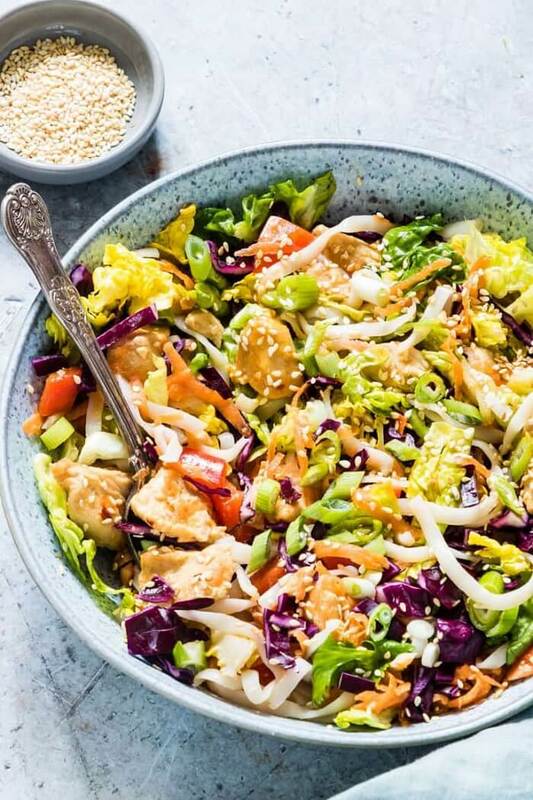 What I love about this Chinese chicken salad is how sweet and crunchy it is. It only takes 10 minutes to put together, even with the homemade salad dressing, which also doubles as a wonderfully tangy marinade for chicken. Look how absolutely beautiful that dish is. 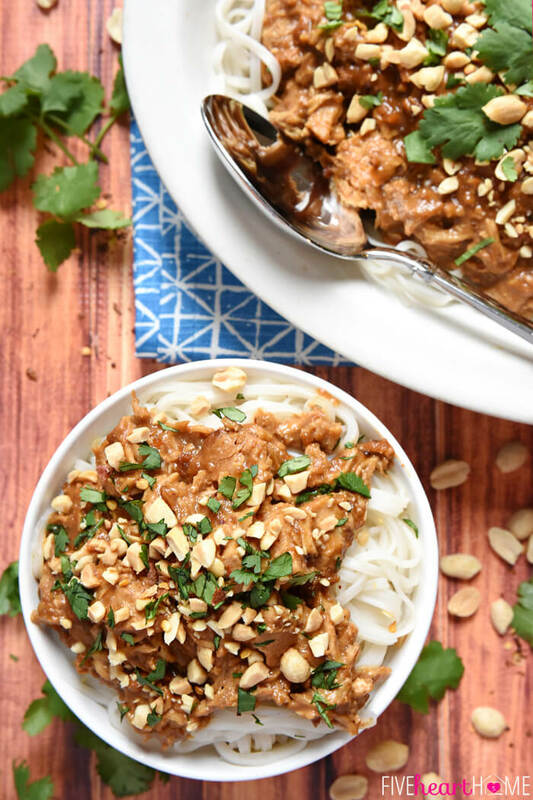 Colorful and creamy, it tastes great served alongside potatoes and veggies, or even better as a sauce for noodles! It’s a 30 minute meal that you’ll definitely want to add your regular rotation! 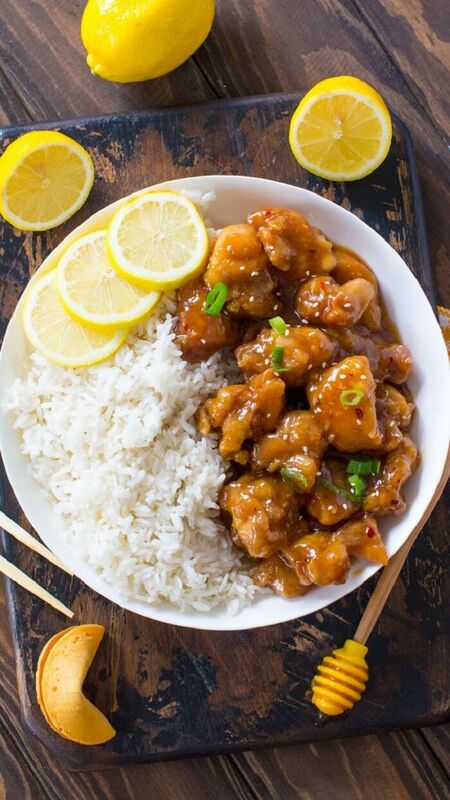 If you love orange chicken, you will definitely love this crispy honey lemon chicken. It’s sweet, it’s sticky, it’s tangy and citrus-y, and rather than scouring the globe for take out restaurants that actually serve this yummy dish, you can make it at home any night of the week. In one pan! In less than 30 minutes! Boom! This cheesy chicken recipe is making my mouth water. It’s juicy, it’s tender, it’s flavorful and every bite is loaded with cheesy goodness, I mean….come on, YOUR mouth should be watering, too! This chicken is great served over rice, or shred it up and put it in a burrito for a Taco Tuesday twist! 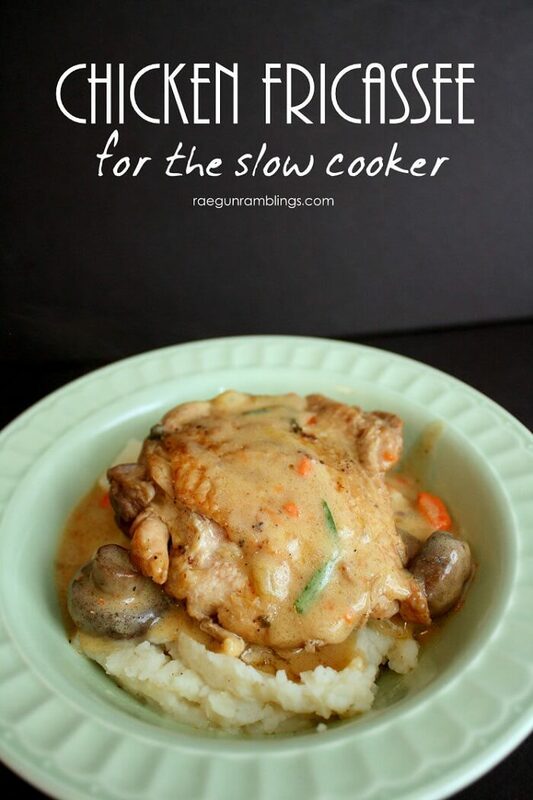 This slow cooker recipe does require a few more steps than normal slow cooker recipe, where you just dump everything in and walk away until it’s done cooking. But it’s well worth it. Make the sauce, pour it over the chicken, then when it’s done cooking, stir in the spinach until it’s wilted. It’s delicious, and you’ll be glad you took those extra steps. I’ve been hearing a lot about hatch chiles recently, and probably for good reason. They’re a domestic chile from New Mexico that feature a slight smoky flavor and they’re absolutely delicious! 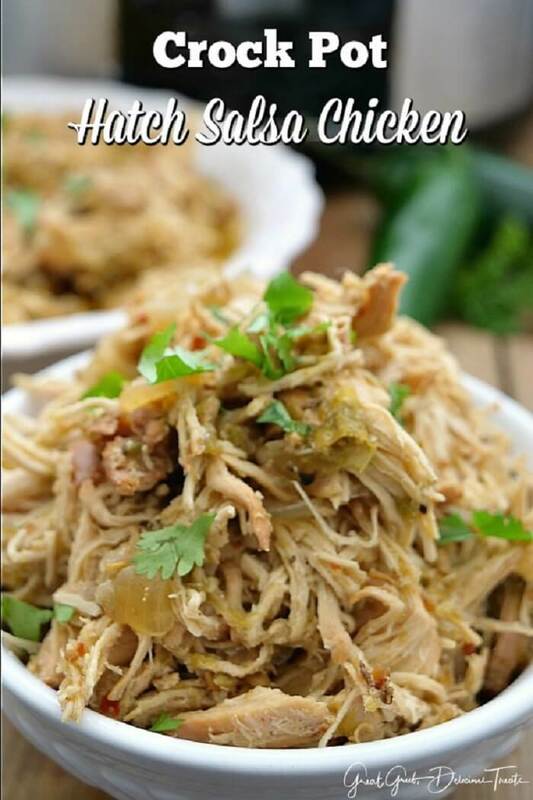 Therefore, it stands to reason, that this shredded chicken recipe made with hatch chile salsa is also absolutely delicious. You guys, check it out! 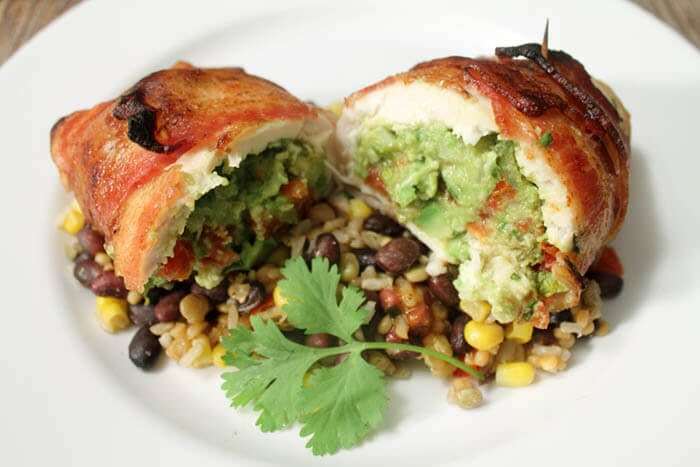 It’s guacamole stuffed inside chicken and wrapped in bacon! Whoa! Doesn’t that sound absolutely amazing?! 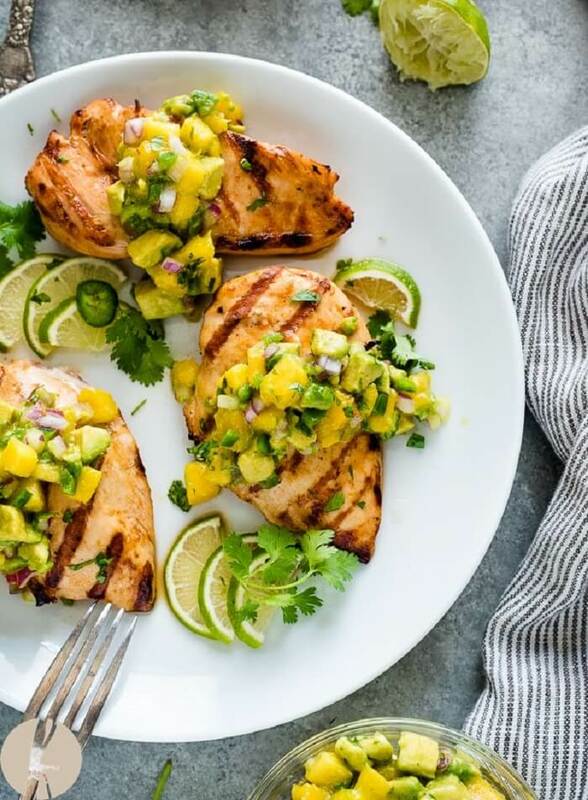 This recipe has us putting it in an oven to bake, but I think it would taste phenomenal cooked on the grill, too! Chicken parmesan is a classic Italian recipe that just about everybody loves. But not everybody loves making it, because let’s get real here – it can be a lot of work. But this recipe makes it easy. AND it’s made with no added fats or oils, so it’s a lot healthier, too! Do you own an Instant Pot? It’s a definite game changer. I didn’t know how much I would absolutely love it until I started cooking with it and now I can’t imagine my life without it! It’s great for one pot meals such as this classic rice and chicken, and it doesn’t heat the house up like baking it in the oven would do. 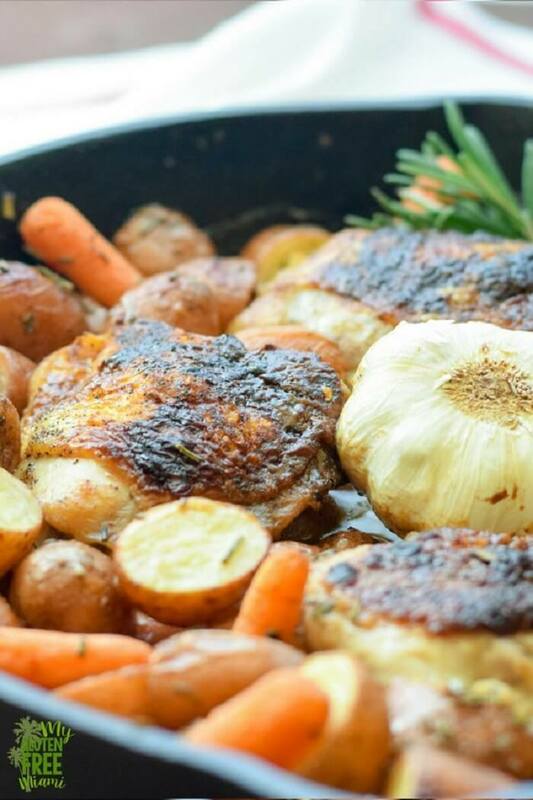 Speaking of one pot meals….this sheet pan chicken is an absolute life saver, too! Everything goes in the oven on ONE pan and comes out all together for an easy, deliciously spicy meal any day of the week. Chicken tenders are my jam. When I was a kid, I would order them at every restaurant that had them (which was pretty much every single restaurant in existence, lol). It just doesn’t get much simpler than this, folks. 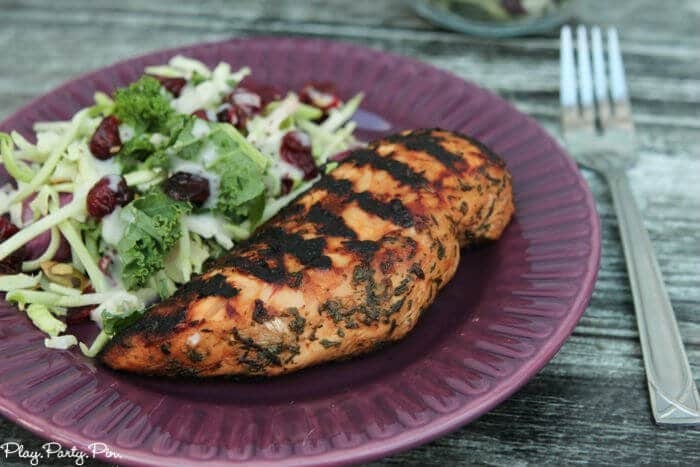 Grilled balsamic chicken is the smart & easy choice when you’re having one of those days and don’t want to spend a lot of time in the kitchen, but still want a deliciously tasty home cooked meal. 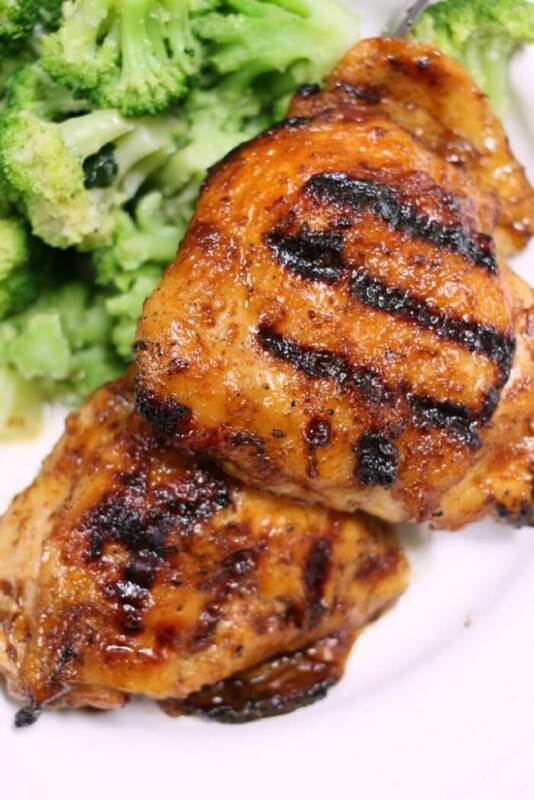 I am loving this grilled chicken recipe. It’s making me want to kick back on a beach somewhere with a margarita and the salty ocean breeze blowing through my hair. Have a craving for some Chinese take out but your waistline is saying “uh uh, nope”? Well, well, well….this is the recipe for you. Chicken shawarma is a wonderfully flavored Mediterranean dish. 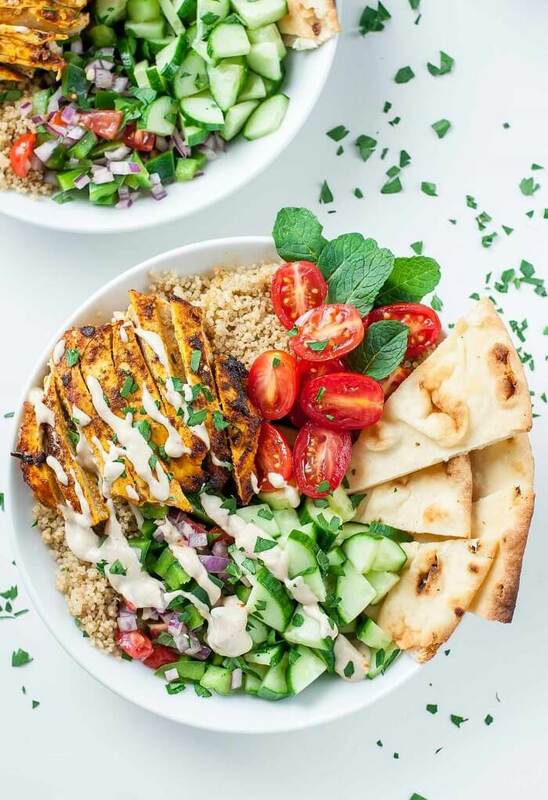 This chicken shawarma quinoa bowl is dairy free, full of fabulous flavors and tastes even better the next day, making it a great option for prepping lunches for the week! 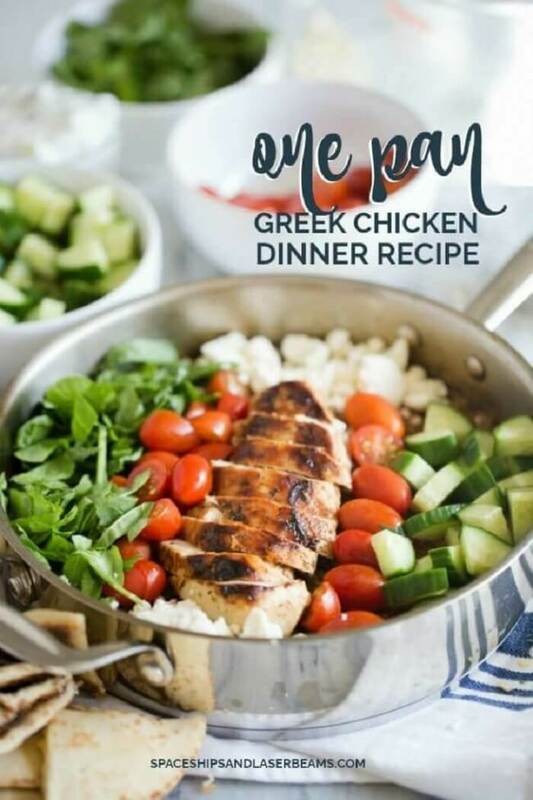 This chicken is a staple meal prep recipe! It’s the kind of meal you want to have on a Sunday, surrounded by friends and family. But it’s also wonderful to eat all week! Enjoy what you can at dinner and use the leftovers for all sorts of things from sandwiches, to pulled chicken, to tacos and casseroles! Then use the rest to make a yummy chicken stock! This is everything you want in a chicken recipe. Tons of flavor, crispy tender chicken, bright sunshine-y lemon. This is the kind of chicken recipes that wins favors and influences people. This keto friendly recipe is not for the faint of heart. Made with sour cream, mayo, and cream cheese, it’s the kind of creamy dream one just drools over. I think my favorite part about this dish is the fact that the sauce is thick enough and delicious enough to stand on it’s own! Serve it with your favorite chips or raw veggies and it tastes great as a spinach dip. 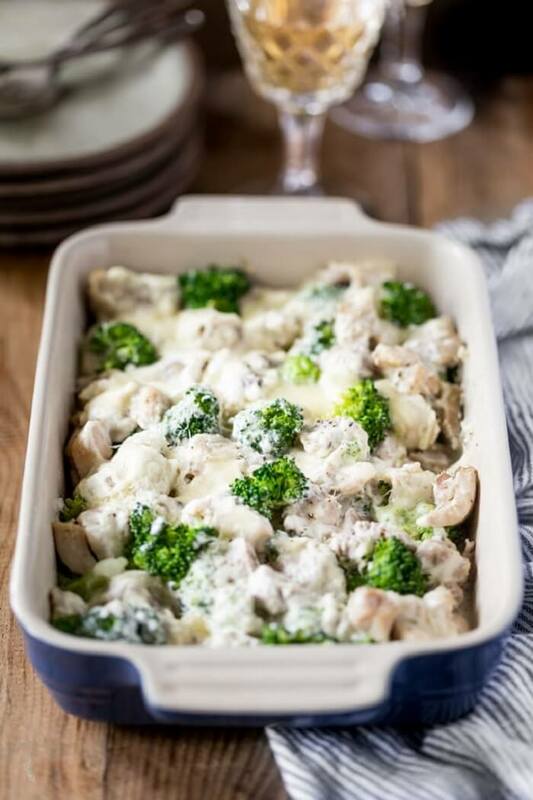 Chicken Divan is a chicken casserole made with broccoli, chicken, and cheese sauce. Most recipes call for condensed soup and mayo, but this healthier version is made cream cheese instead! 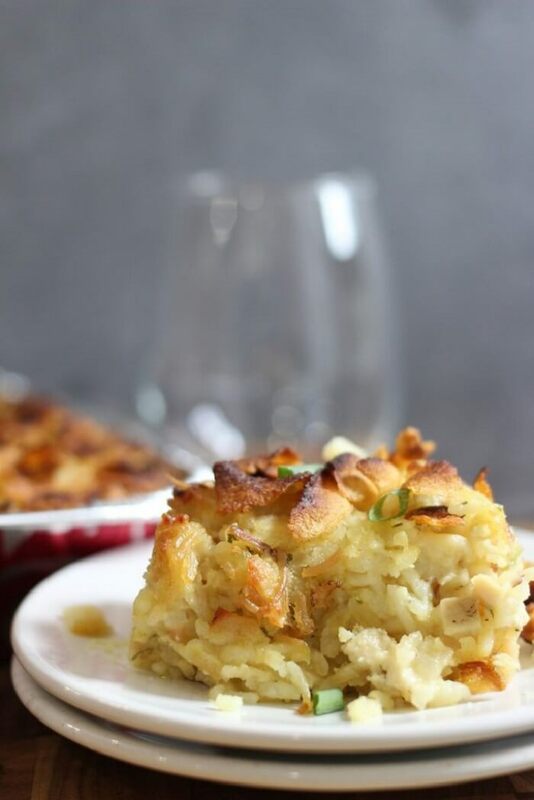 M’mm….what’s not to love about this chicken and rice casserole? 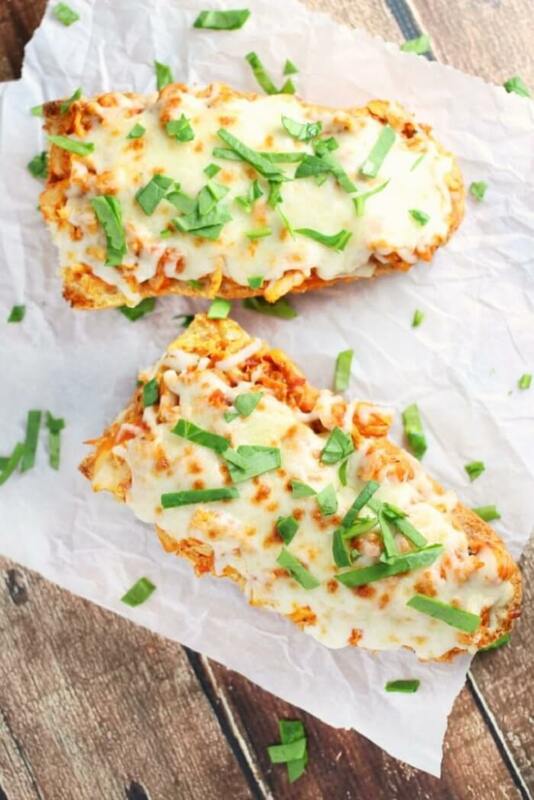 It’s super cheesy and full of yummy ranch flavor – I bet it’ll be a huge hit in any kitchen! 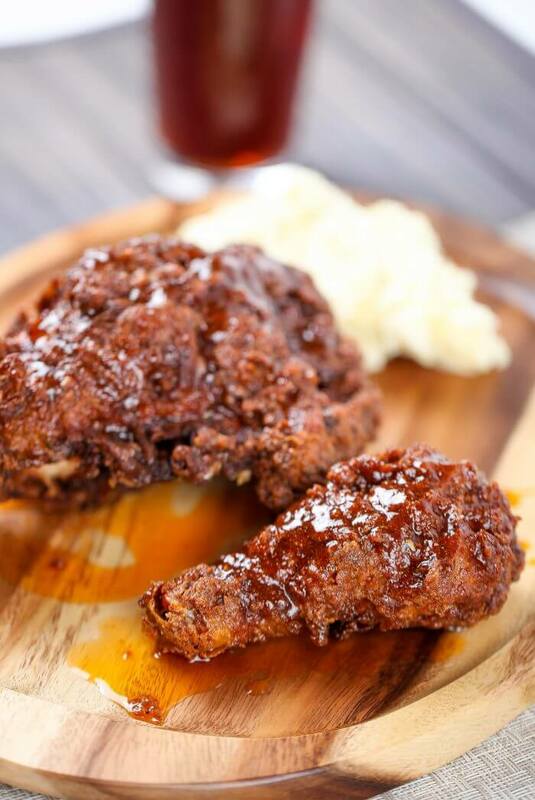 If you’ve ever been to Nashville, chances are you’ve had Nashville Hot Chicken. Apparently, it’s so popular, it even made it’s way onto the local KFC menu! It’s super duper crispy, crunchy, and a little spicy with a sauce that you can either brush in, or serve on the side for dunking! I just love the lemon-y flavors of Greek food. Not to mention a Mediterranean diet is super healthy for you! This one pot dish is one you can feel good about feeding the whole family, and the whole family will feel good about eating. 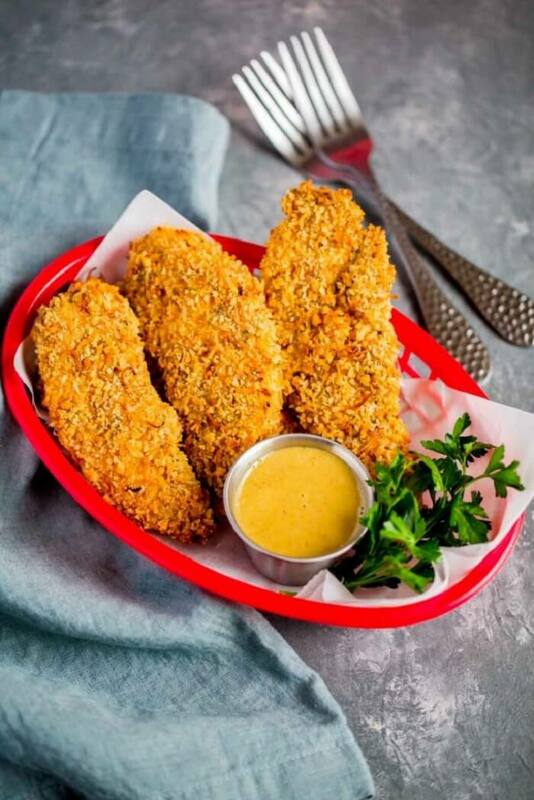 What is it about honey mustard that just makes it pair SOOOOOO well with chicken? I don’t know, but it’s seriously in my top 5 favorite flavors if not in the actual number one spot. 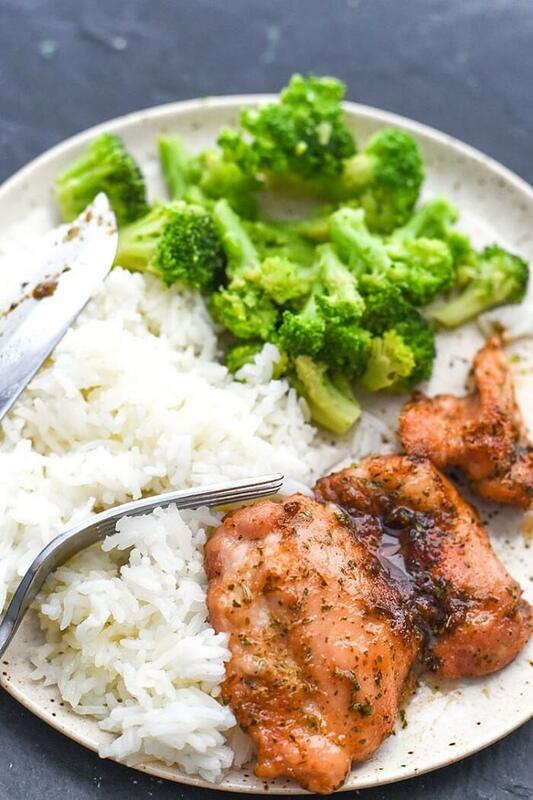 This one pan honey mustard chicken recipe is so easy to make, and the flavors will have you drooling for days. 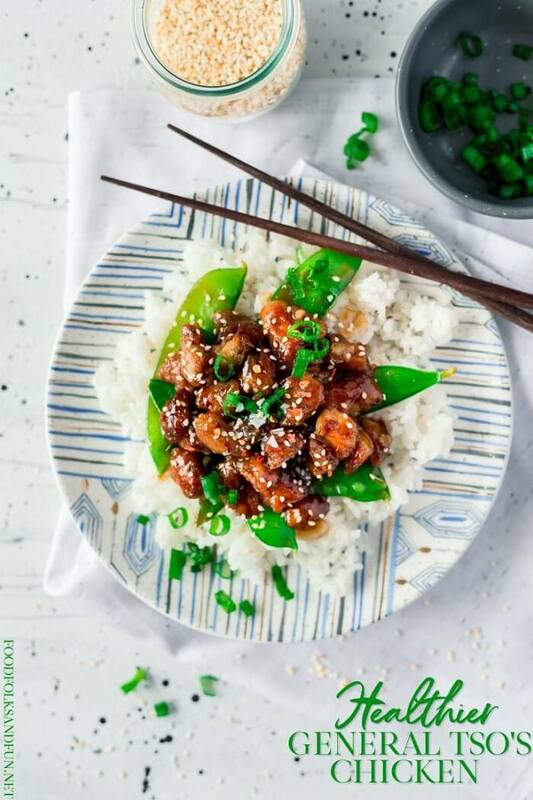 There are all sorts of orange chicken recipes out there…some super simple with just a few ingredients, and some a little more involved. 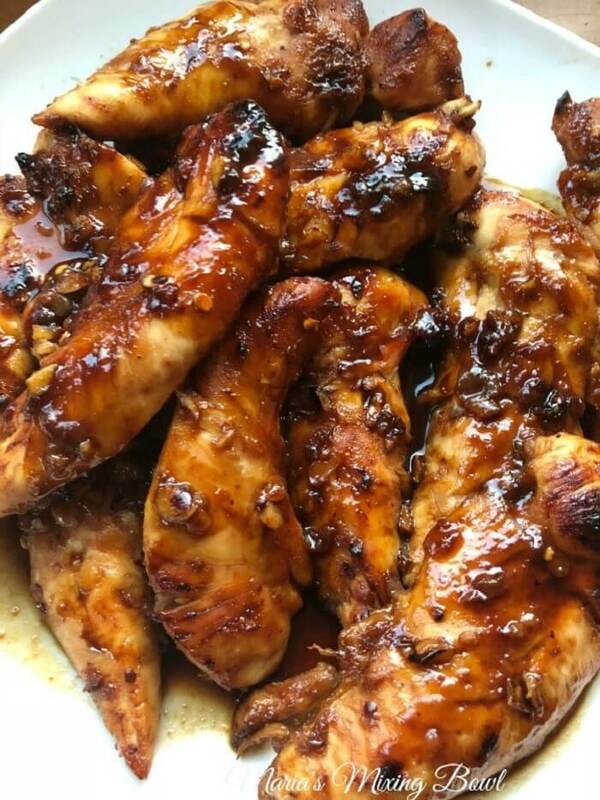 I love this recipe because the chicken is baked or stir fried (or however you prefer to cook your chicken ahead of time) instead of fried, and the sauce is made from scratch so you know exactly what you’re getting. Don’t you just love cooking in your cast iron pan? I know I do….I’m not sure why, there’s just something so….rustic and nostalgic about it. 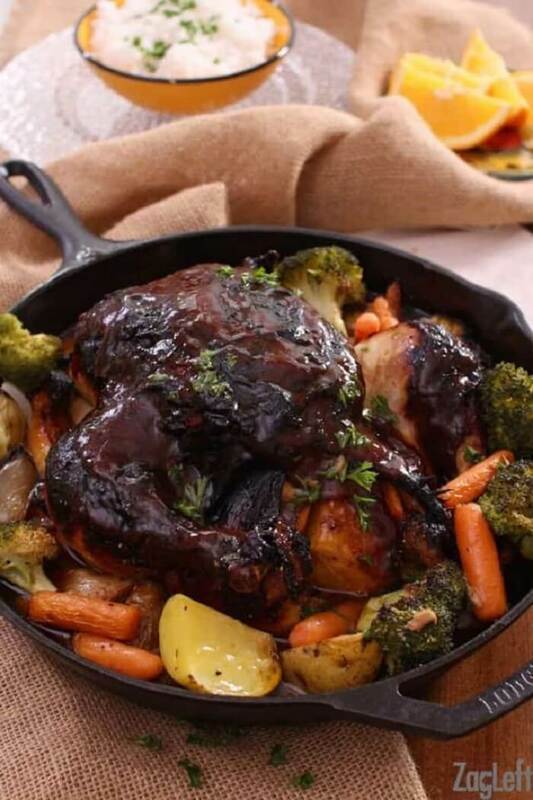 This roasted BBQ chicken is the perfect weekend dinner for the family. Or heck, just make it for yourself and use the leftovers all week long! Pizza lovers! 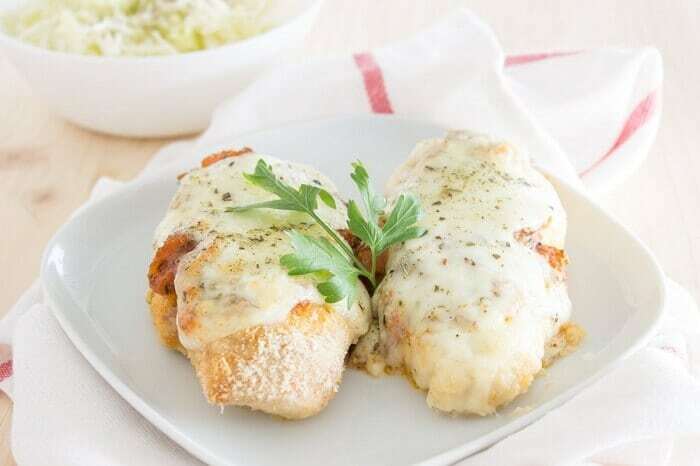 You will love this pizza chicken recipe! It’s super simple, packed with all that pizza flavor we all know and love. Serve it with a side salad or use it on a thick slice of crunchy dense bread as an open faced sandwich. This is one of the best recipes to ever come into existence. Seriously. It’s TWO ingredients. TWO!!! 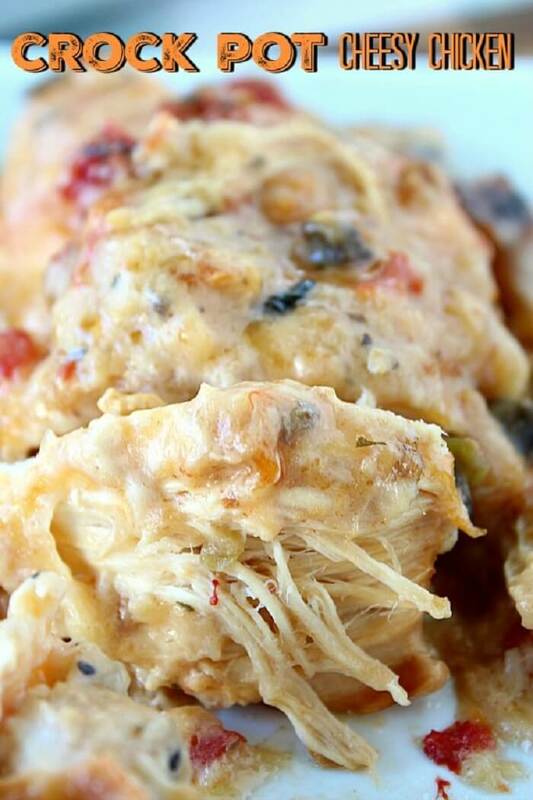 Just toss it in your slow cooker and a few hours later, you’re good to go! It’s great for entertaining, potlucks, or picnics! 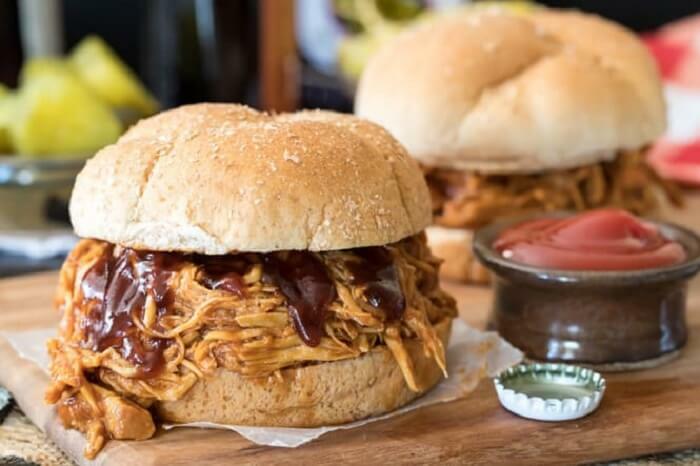 I love slathering a big pile on top of a delicious bun, pouring a little extra BBQ sauce over it, and topping it with a sweet and slightly tangy coleslaw. M’mm…..
Yum! This salad is easy to toss together and loaded with flavor! 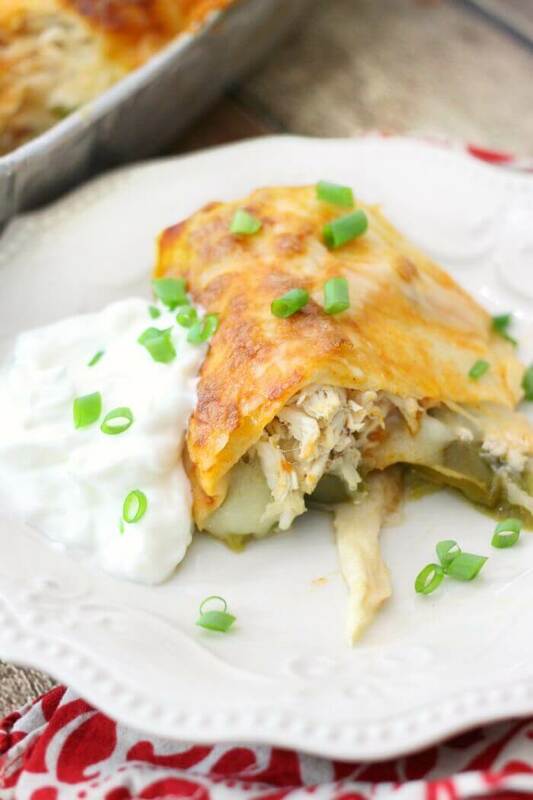 It’s great as a light weeknight dinner, or take it to work with you for lunch! 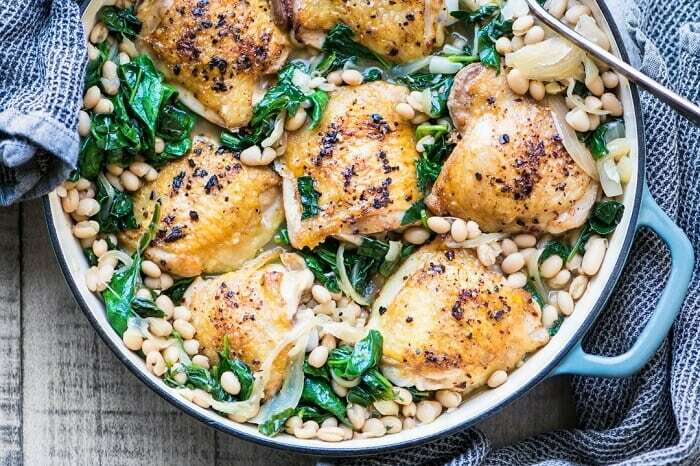 One pot meals are a definite life saver. 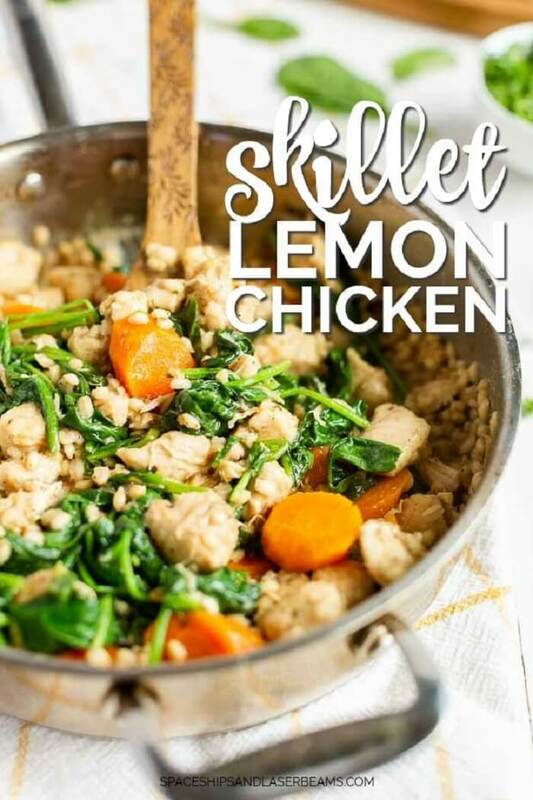 This skillet lemon chicken is no different! Packed with flavors, it only uses a handful of ingredients and comes together in no time, which means you spend less time in the kitchen and more time with the people and things that are important to you. 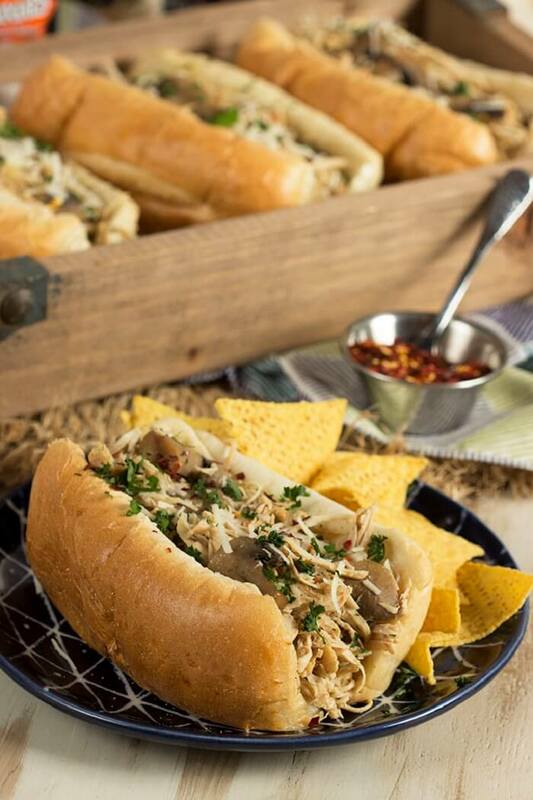 Not only is this chicken cheesesteak sandwich a healthier version of our Philly favorite…it’s also a lot easier to make! It’s great for a crowd, or just make it for your family and take the leftovers to work. Easy peasy! I absolutely ADORE Thai inspired dishes. They generally include flavors that I wouldn’t normally associate with savory proteins, such as peanut butter or honey, but it all blends so well together. This recipe uses only ingredients that you most likely already have stocked in your pantry. You can serve it over noodles or rice, or even use it as a filling for lettuce wraps! Yum! This recipe does involve a little bit of prep work, but trust me when I say it is well worth the effort. 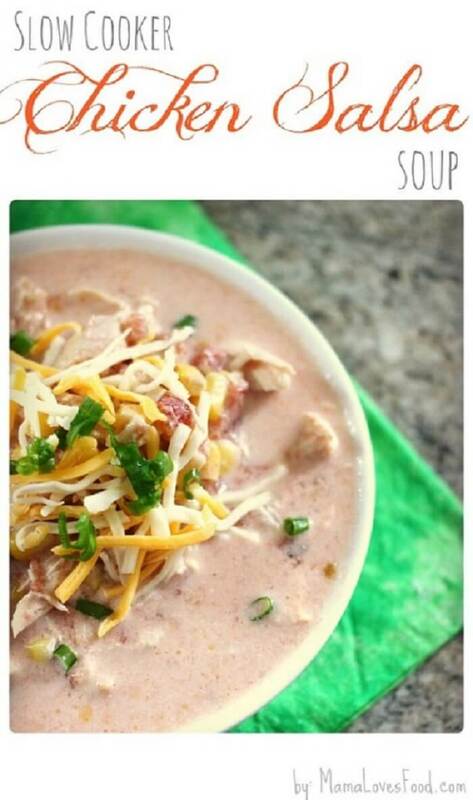 It’s creamy and delicious, and incredibly flavorful! The best part is, you can absolutely adjust it to your own tastes! 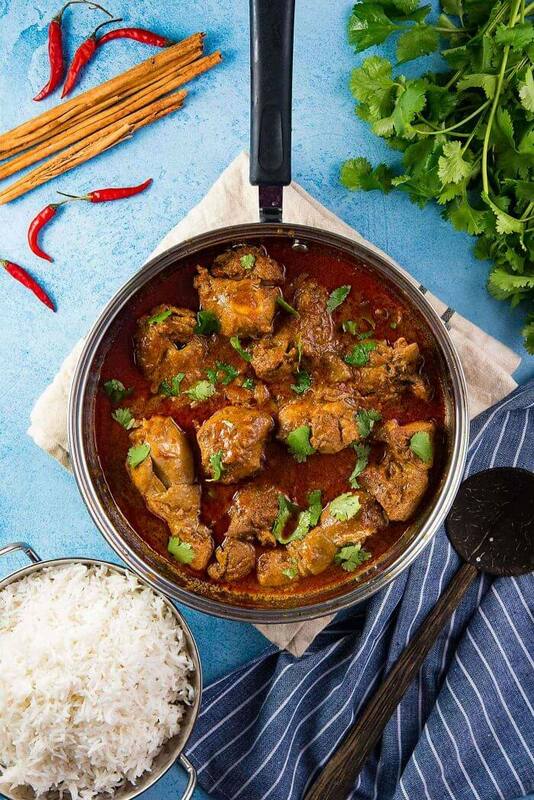 Make it less spicy or more spicy, reduce the fat by using water instead of coconut milk, make the sauce thick or thin, or use boneless chicken or bone-in chicken – whatever you prefer! Versatility is the spice of life, right? 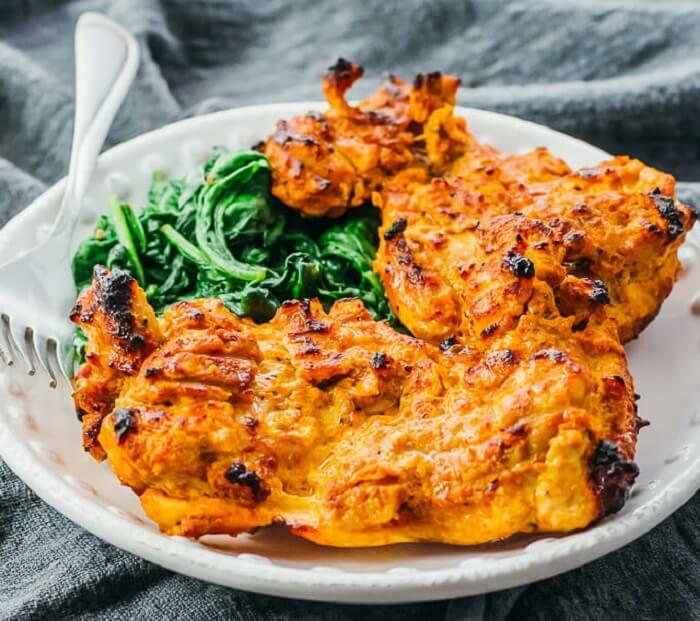 Tandoori chicken is traditionally made in a tandoor, which is a cylindrical shaped clay oven, BUT…I don’t know a whole lot of people who happen to have one of those in their kitchen, so this recipe is cooked in the oven under the broiler and the resulting crispiness is absolutely heavenly! I just love everything about this soup. It’s full of veggies, and is just the right combination of sweet, salty, spicy and creamy. 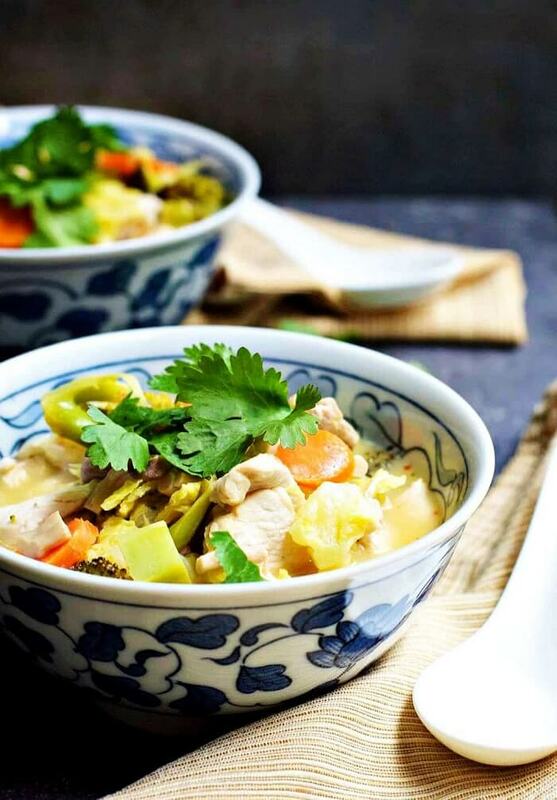 You’ll feel like you’re sitting in your favorite Thai restaurant when you have a bowl of this! 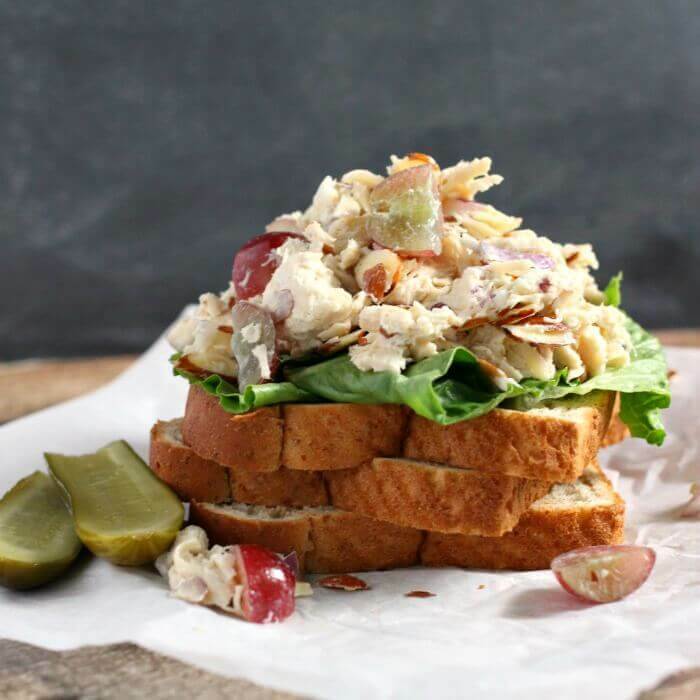 Chicken Salad is one of my favorite chicken recipes! Quick to make and delicious. 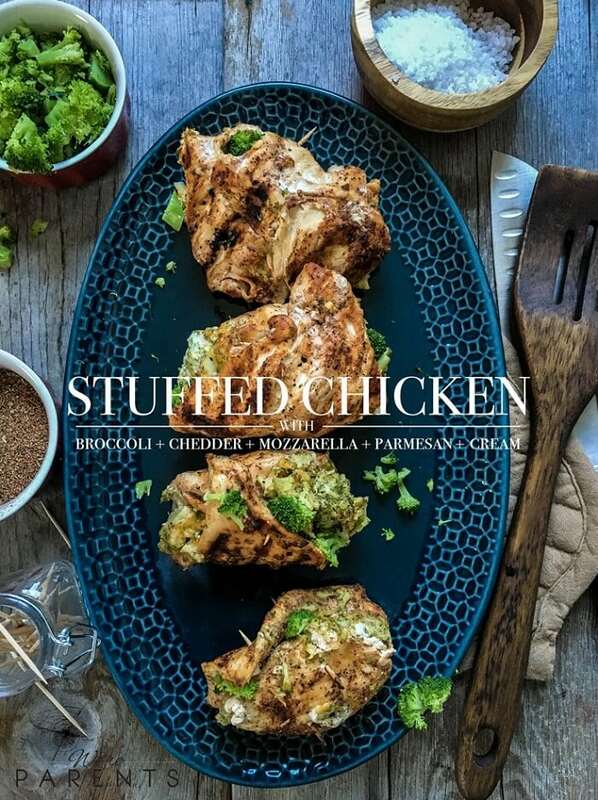 Wow – what an amazing, varied, and inspiring set of chicken recipes. Thank you for putting this together. OMG! I will never wonder what to do for dinner again! So much chicken goodness! I absolutely love chicken salad sandwiches for lunch and yours nails it! So yummy!